© 2009-2018 Kevan Hashemi Open Source Instruments Inc.
A faraday cage is an enclosure with electrically conducting walls. 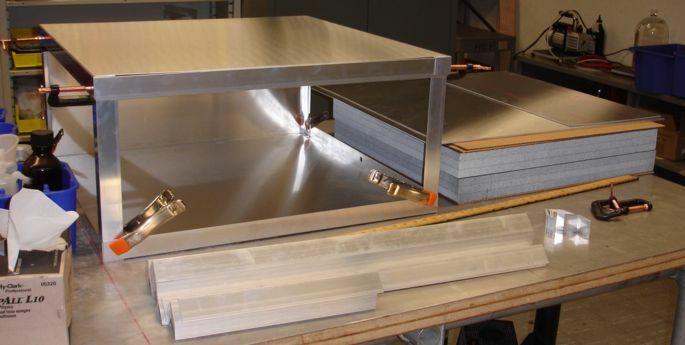 Electromagnetic waves cannot pass through a conducting wall, so an enclosure with conducting walls stops electromagnetic waves from either entering or leaving the enclosed space. Such an enclosure is usually called a faraday cage. We call them faraday enclosures to avoid confusing them with animal cages. Figure: Four FE3A Faraday Enclosures and Recording System. Our Subcutaneous Transmitters (SCTs) radio frequency (RF) signals are broad-band and low-power. Our Subcutaneous Transmitter (A3028) transmits 300 μW spread across the 902−928 MHz Industrial Scientific Medical (ISM) band. These signals are easily swamped by interference. Without a faraday enclosure, a mobile phone base station can disrupt reception from implanted SCTs at a range of 1500 m. With a faraday enclosure, the same disruption will not occur unless the base station is 50 m away. Figure: The FE2F Front-Loading Faraday Enclosure, Door Closed. Outer dimensions are 62 cm wide, 33 cm hight, and 64 cm deep. This enclosure is large enough for two rat cages side by side, and provides feedthroughs for three antenna cables. Another reason we use faraday enclosures is to guarantee that no detectable signal from our transmitters emerges from your telemetry recording room. In North America, South America, and the UK, any device may use the 902-928 MHz band provided the device's peak power output is less than 1 W. In other countries, the 902-928 MHz band is licensed for amateur radio and radiolocation systems, and regulations prohibit our system from radiating intentionally within the band. The average 902-928 MHz power escaping a faraday enclosures containing ten implanted SCTs is <10 nW. This power generates an electric field strength <60μV/m at range 10 m, which satisfies the ≤210 μV/m electromagnetic emission limit for unintentional radiators under regulations common to all nations. Figure: The FE4A Isolation Chamber, Without Mesh Cover. 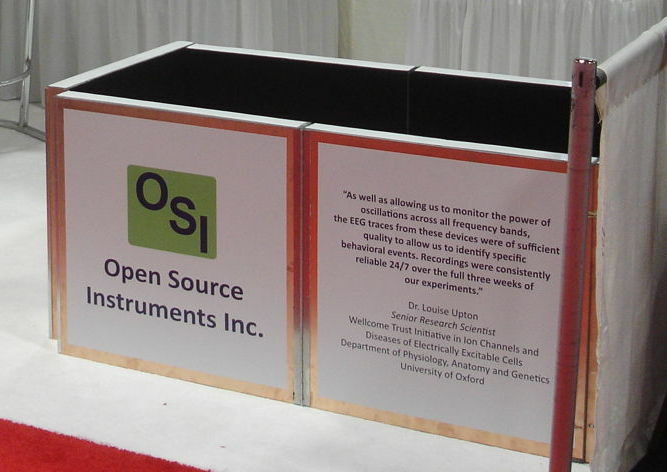 This chamber, set up at the Society for Neuroscience Show in 2014, provided superb reception for randomly-moving transmitters on its carpeted floor, even with its reflecting mesh lid removed. We detect the SCT signal with a Loop Antenna (A3015C) plugged into an Octal Data Receiver (A3027). When the antenna is 30 cm from the transmitter, our signal is attenuated by at least a factor of one hundred (see Reception). When the two antennas are unfavorably oriented, we can suffer another factor of one hundred attenuation (see Omni-Directional Antennas). With conducting surfaces nearby, we can suffer another factor of ten loss due to multi-path interference (see Multi-Path Interference and Radiated Power). We can end up receiving only ten parts per million of the power we transmit, or 3 nW. Figure: The FE3AS Large Front-Loading Faraday Enclosure with Shelf, Door Open. Outer dimensions are 91 cm wide, 60 cm hight, and 65 cm deep. 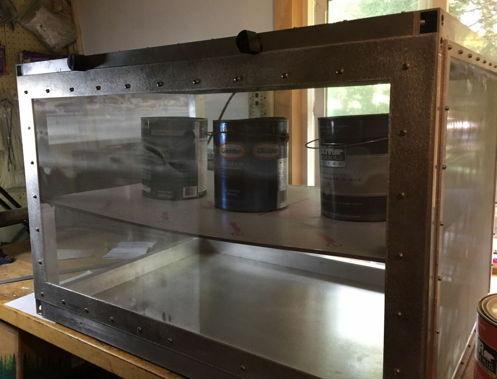 This enclosure ships as seven panels and four struts that our customers assemble themselves. For same enclosure with door closed, see here. For accurate reception, the RF signal power we receive from the SCT must be twenty times higher than the total ambient interference power in the ISM band (see Foreign Interference). If we are to be certain of accurate reception within 30 cm of an antenna, the ambient interference in the ISM band must be less than 150 pW. In our basement OSI laboratory, ambient interference in the ISM band varies from 100 pW to 100 nW as local ISM band transmitters turn on and off. A faraday enclosure, consisting of conducting metal walls and one absorbing wall, provides a factor of one thousand attenuition of ambient interference. 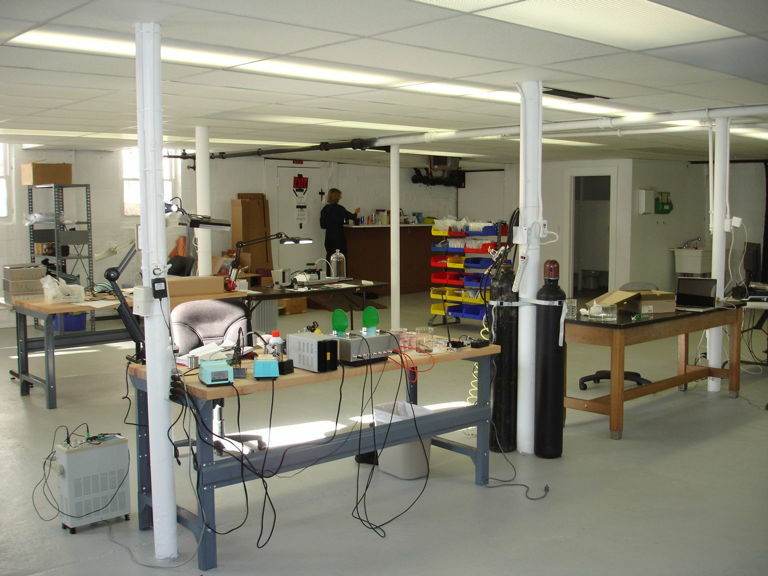 In our basement laboratory, interference within a faraday enclosure is always less than 100 pW and reception within a faraday enclosure is robust. Figure: The FE2C Stack, Built at ION. Five front-loading faraday enclosures on top of one another with rolling wheels underneath. The stack can be moved around the laboratory. Our faraday enclosures provide connected, conducting walls with one microwave-absorbing surface. Steel mesh allows light and air to enter and leave. A microwave absorber in the ceiling stops the interior from resonating at our operating frequency. Coaxial feedthrough connectors in the back wall allow us to insert one or more antennas in the interior. Ethernet and USB feedthroughs allow us to place webcams and location trackers into the enclosure along with our antennas. The enclosure not only reduces the power of the interference at the receiving antenna, but also, by trapping the transmitter signal in a finite space that does not resonate, we increase the minimum power we receive from the transmitters. Our operating range within such enclosures extends to all corners of the enclosure itself. By surrounding an IVC rack of eighty mouse cages with steel mesh curtains and a back wall of absorbers, we can record from dozens of animals at one time with one Octal Data Receiver. The IVC rack enclosure provides robust reception in London within 100 m of a 900-MHz GSM mobile phone base station. In Edinburgh, however, not even our FE4A enclosure can provide robust reception within 50 m of three 900 MHz GSM base stations. Before you select a location for your telemetry system, we recommend you check the location of local mobile phone base stations. If they are within 100 m, facing directly towards you, and you are high enough off the ground to be directly in their line of transmission, we will advise on measurements you can make of the interference power so as to determine whether your preferred space can suppor our SCT system. For a free-standing system, we recommend our FE3AS as the most compact, effective, and economic enclosure. 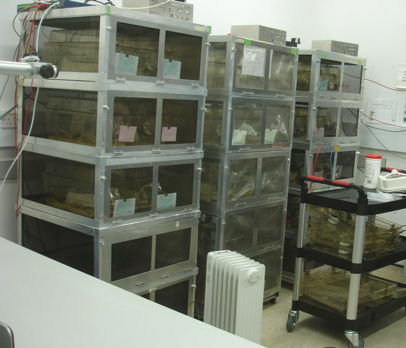 The FE3AS will house six mouse cages, three on the floor and three on its shelf. It provides robust reception throughout the enclosure with two antennas, and near-perfect reception with four antennas. The front wall of the enclosures is a large door that swings down, giving access to the entire interior space. All our front-loading aluminum-frame enclosures can be stacked up into towers on wheels that provide mobile telemetry for dozens of animals. Table: Exterior Dimensions of Faraday Enclosures. We give the number of standard rat cages that will fit easily in the enclosure, and the recommended number of antennas for robust reception from all animal cages within the enclosure. The FE2 and FE3 devices have a 5-cm thick absorber in the ceiling so the interior height is 5 cm less than the exterior height. The interior width and depth of the aluminum frame enclosures are 1 cm smaller on account of the thickness of the aluminum brackets. The interior height is 6 cm shorter because of the foam absorber on the underside of the lid. The opening at the top of the enclosure is roughly 90 mm smaller on account of the width of the aluminum brackets. The 6-mm thick, clear, polycarbonate shelf provided by the FE3AS enclosure will sag by <2 mm when loaded by three 1-kg animal cages. When we place three 5.7-kg paint cans on the shelf, it sags by ≈6 mm, as you can see here. In the IVC rack enclosure we recommend distributing sixteen antennas throughout the IVC rack and connecting them in pairs to the eight antenna inputs of an Octal Data Receiver. So long as the antennas that are paired together are more than 60 cm apart, they provide increased cover within the rack. Enclosures with hinged doors, such as the FE2C, FE2D, and FE2F, are harder to assemble, but the hinged door is more convenient, permits stacking of the enclosures, and gives good isolation provided there is tight contact between the door and the enclosure chassis. An easier door to assemble is a sliding door, such as in the FE2D. A sliding door gives good isolation if it is equipped with conducting foam gaskets around the edges, as shown in this close-up of the FE2D door corner. Figure: FE2B Packed Up for Shipping. Packing a fully-assembled faraday enclosure takes care and shipping is expensive. 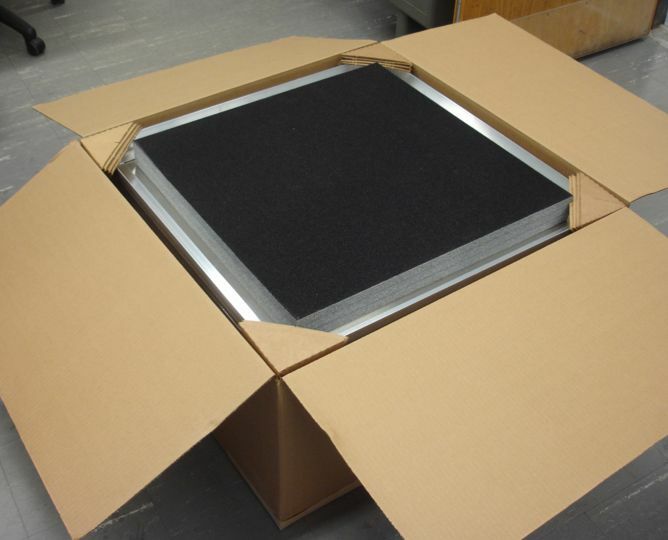 When possible, we pack other items iside a box within the faraday enclosure, so as to save on total shipping cost. Our FE3A and FE3AS enclosure come as a flat-packed kit with assembly drawings and a parts list, and all necessary screws, washers, knobs, and hinges. Each enclosure uses over a hundred screws to secure the walls to the frame, so as to create a tight seal against radio frequency interference. We recommend a torque-controlled battery-powered screwdriver to drive the screws to within one turn of tight, then tightening by hand the last turn. Allow two hours to assemble one enclosure. 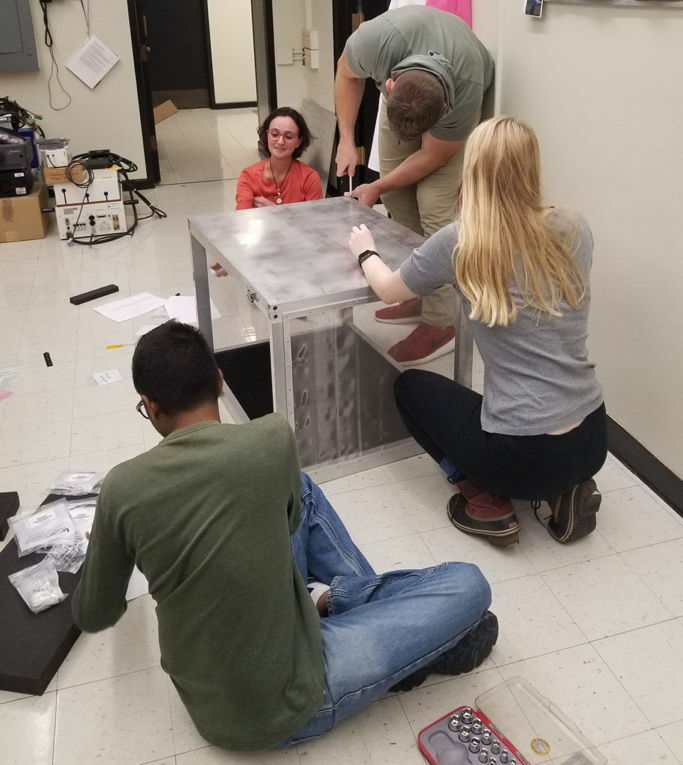 Figure: A Team of Scientists Assembling an FE3AS Faraday Enclosure at SUNY Albany. The enclosure is upside down right now, having its floor screwed in place. The black foam on the ceiling is microwave absorber. Our FE2F enclosure ships fully-assembled in a box, with the exception of the front door knob, our customer must assemble upon receipt. We provide this Doorknob Assembly Drawing. Some of our customers have their machine shops make enclosures to their own design: the FE2C and FE2D were both designed by our customers. Figure: Top-Loading Faraday Enclosures Assembled from Kits of Parts. Each contains two animal cages with water bottles. 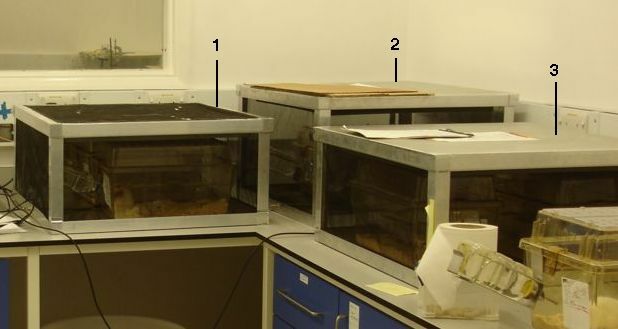 Marked are (1) a prototype version of the FE2B with mesh side walls, (2) an FE2A, (3) an FE2B. Photograph taken at ION 04-NOV-10. The FE2A and FE2B are straightforward to manufacture. But they are less rugged than our newer versions, because they rely upon glue and aluminum tape rather than screws to hold them together. They are less convenient to use because they have a lid rather than a door, and they cannot be stacked upon one another for the same reason. Figure: FE2B Under Construction. This kind of clamp and glue construction, in which we tape the steel mesh to the frame, is straightforward to perform in any laboratory. Note the microwave absorbers stacked on the right side. The frames of these enclosures are aluminum angle struts. We cut the struts to length and glue them together to make the frame and lid. The labor is distributed over several days, to allow time for epoxy to cure. 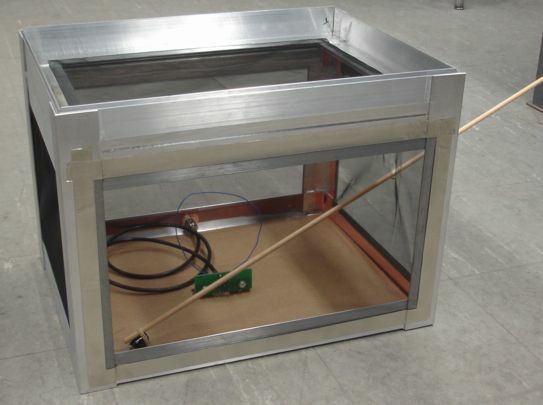 If you would like to make your own enclosure with a removeable lid, consult our Enclosure Assembly Manual. The manual lists the parts you need and tells you how to put them together. 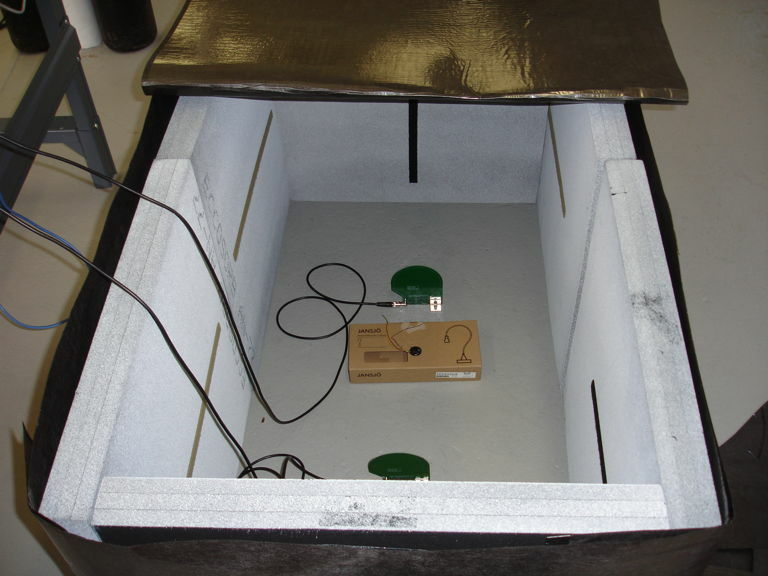 [08-APR-09] We construct two faraday enclosures with the help of cardboard boxes. The first uses aluminum foil as the conducting wall material and the second uses aluminum mosquito screen with 1.5-mm square holes. To test the effectiveness of the enclosures, we set up our 910-MHz SAW Oscillator (A3014SO) 5 m from our RF Spectrometer (A3008) and measured the power received by the spectrometer as we placed it in the enclosures. Table: Power Received for Various Shielding. The power we received depended upon the exact position of the spectrometer, regardless of the shielding. We see a ±1 dB variation as we move the spectrometer by ±10 cm. But it appears that the foil enclosure gives us 28 dB attenuation and the screen enclosure gives us 16 dB. Sealing the foil and screen around the corners and lid of the enclosure is important: poor sealing can case a jump of 10 dB in the power inside the enclosure. Figure: Foil Faraday Enclosure. 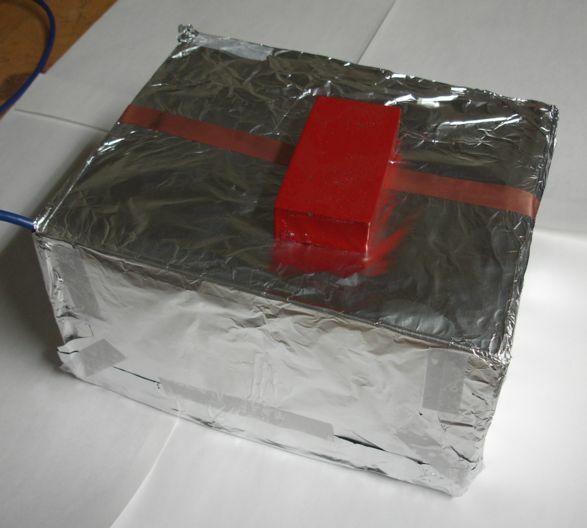 The foil is taped onto a cardboard box 25 cm × 20 cm ×14 cm. Whatever faraday enclosure we use around our animal cages, it must be transparant and rugged. A foil shield is neither transparant nor rugged. The screen enclosure is both. It gives us 16 dB attenuation, which would drop the estimated −56 dBm ambient interference in the ION laboratory down to −72 dBm, and so increase our operating range there from 25 cm to around 200 cm. Our aluminum mosquito screen was $1 per square foot. There are better meshes available, such as these. The vendor claims that their VeilShield gives 50 dB attenuation at 1 GHz. They sell it for $3 per square foot and it comes in 58-inch wide rolls. [09-APR-09] We want to know if reflections inside a faraday enclosure will cause more severe multi-path interference than outide a faraday enclosure. We placed our spectrometer inside the foil enclosure. We attached an encapsulated A3013A to a stick. With the tip of the stick protruding from the enclosure, we rotated and moved the transmitter. The power measured by the spectrometer at the center of the transmitter's spectrum varied from −43 dBm down to −72 dBm. When we perform the same experiment outside the enclosure, the power varies from −33 dBm down to −78 dBm. It appears that our problems with multi-path interference and poor orientation are alleviated in the enclosure. Certainly, they are not exacerbated. [09-APR-09] We placed the Data Receiver antenna in the foil enclosure. We placed a transmitter outside the enclosure at a range 30 cm from the antenna. We moved and rotated the transmitter. We obtained robust reception. There were precise locations where reception became intermittent. We placed the transmitter in the enclosure and the antenna outside the enclosure at a range of 30 cm from the transmitter. We obtained no reception. This simple experiment proves that interference is limiting our operating range. Let us consider both stages of the experiment in turn. When the antenna is in the enclosure, both the signal and the interference are attenuated by the faraday enclosure. Let us assume the faraday enclosure attenuates both signal and interference by 28 dB. 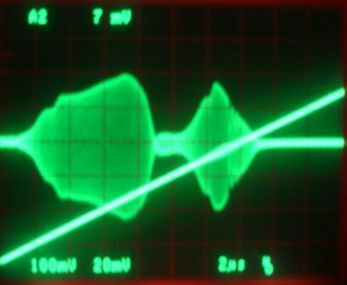 The interference power drops to −88 dBm, on a par with the receiver's noise power (which is −90 dBm, see Noise and Interference). Our signal can drop to −4 dBm at the transmitter, −22 dB for 30 cm of air, −17 dB for unfavorable orientation, −10 dB for multi-path interference, −28 dB for the faraday enclosure, which is −80 dBm. Our receiver works down to −76 dBm (see Demodulator). And so reception fails in a few precise orientations of the transmitter outside the faraday enclosure, and is no worse than reception without the faraday enclosure. When the transmitter is in the enclosure, the signal is attenuated by 28 dB, but not the interference. Even with a precise, favorable orientation of the transmitter, we get no more than −54 dBm at the receiver. Our interference power remains at −68 dBm, so the minimum power required for reception is −56 dBm. When we place the transmitter in a random orientation, we will get far too little power, as little as −81 dBm, for reception. And so we obtained no reception at all the five or six times we placed the transmitter in the foil enclosure and closed the lid. [09-APR-09] We put a transmitter in a plastic bag and wrapped it in one layer of mosquito screen. We placed it in the foil enclosure with the receiving antenna. We obtained intermittent reception. We opened the enclosure and moved the transmitter, and repeated a few more times. We received anything from a 2% to 50% reception. This suggests that the mosquito screen is attenuating the signal by more than the foil enclosure attenuates the interference. 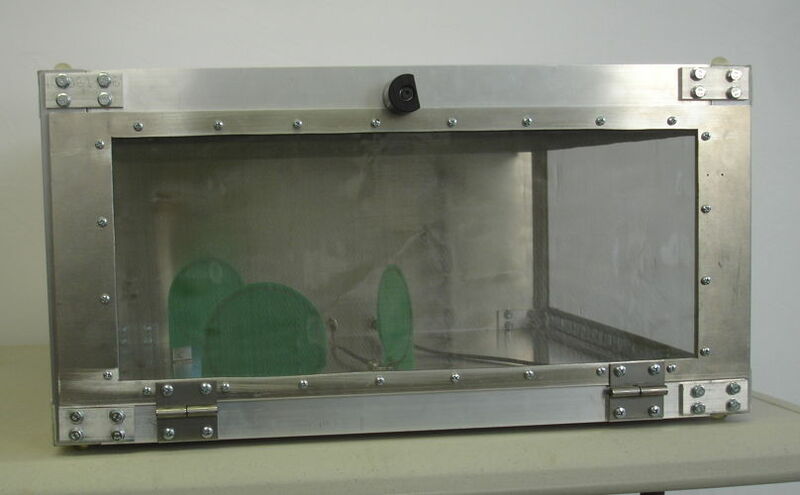 A well-sealed faraday enclosure made of mosquito screen should give us attenuation of 30 dB or more. At ION, such a enclosure would drop the −56 dBm interference down to −86 dBm, and our operating range would jump up to several meters. If we build a faraday enclosure large enough to enclose four animal cages, it would be roughly 100 cm along its longest side. We can hope for prefect reception in all orientations and positions of the transmitter while implanted in an animal. [13-APR-09] We apply an oscilloscope probe on points in the amplifier of our Demodulating Receiver (A3017). We know the gain of each stage the amplifier so we can convert peak-to-peak amplitude on the oscilloscope into power at the antenna input. We use 29 dB for the gain from RF to IF (see schematic) and 71 dB from RF to the output of U204. Our source of artificial interference was our 910-MHz SAW Oscillator (A3014SO). We put its 13-dBm output through a 20-dB attenuator and into quarter-wave wire antenna. Table: Input Power and Reception for Various Antennas and Enclosures. Our power measurements are accurate to ±2 dB. The amplifier gain is temperature-dependent and we must measure peak-to-peak amplitude on the oscillocsope screen. During the course of our experiments, we discovered that grounding the faraday enclosure increased its performance by at least 6 dB. We used a BNC cable union at the point where the antenna cable enters the enclosure, and made sure that contact with copper tape connected the union to the enclosure. This gave us 6 dB more isolation from our 910-MHz interference. When we squeezed the enclosure with our hands, pressing together loose pieces of foil, we obtain up to 18 dB more isolation, bringing the total isolation provided by the enclosure to 37 dB. In the presense of −40 dB of 910-MHz interference, reception from an A3013A at range 10 cm goes from 0% with no isolation to 100% inside our foil enclosure. [17-APR-09] We repeat some previous experiments with our foil enclosure, and increasing levels of ambient interference. We set up our 910 MHz, +13 dBm source with a 30 dB attenuator and an 80-mm antenna. At range 100 cm we receive −53 dBm with a Loop Antenna (A3015A). We place our antenna in the foil enclosure and receive −77 dBm. The foil enclosure is providing 24 dB isolation. Now we begin our experiments. At each step, we select a smaller attenuator for our 910 MHz source. We assume the ambient 910 MHz power around our enclosure increases in proportion to the decrease in our attenuator. We have the antenna in the foil enclosure connected to our Data Receiver (A3018). We hold a transmitter in the enclosure on a stick. We rotate and move the transmitter for one minute while monitoring with the Recorder Instrument. We calculate average, minimum, and maximum message reception over 1-s periods and record it in the table below. Table: Message Reception in Foil Enclosure with Ambient Interference Power. We are moving the transmitter from range 0 cm to 20 cm, rotating it, and pressing it up against the enclosure walls at random. The foil enclosure allows a 20 cm operating range with up to −32 dBm ambient interference. The enclosure attenuates this −32 dBm to −56 dBm. Inside our foil enclosure, our operating range is 20 cm for −56 dBm of interference at the receiving antenna. We set up our 910 MHz source one meter from a receiving antenna with no faraday enclosure. We added attenuators until the antenna received −56 dBm. We moved our transmitter around between 0 cm and 20 cm of the antenna, and monitored reception. The result is the final line in the table above. Given the same interference power at the receiving antenna, reception from a subcutaneous transmitter appears to be slightly better inside a faraday enclosure than outside. On average, reflections off the enclosure walls appears to help rather than hinder reception. The dominant effect of a faraday enclosure is to attenuate ambient interference. In today's experiments, we obtained operating range 20 cm with −32 dBm interference outside the enclosure. We can obtain the same operating range without a faraday enclosure only if ambient interference is lower than −56 dBm, or 0.4% of the power we can tolerate with a faraday enclosure. 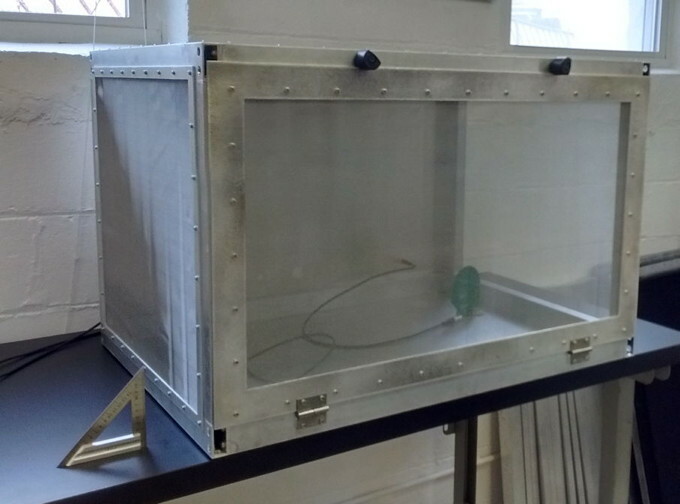 [29-APR-09] We have our prototype screen-walled faraday enclosure. It measures 40 cm × 30 cm × 30 cm. The frame is made of 1.6-mm thick aluminum angle brackets. The walls are made of stainless steel VeilShield fabric. The fabric is taped to the frame with a variety of metal tapes. Figure: Prototype Faraday Enclosure, with Steel Fabric Walls. The stick with a transmitter on the end shows how we manipulate a transmitter to test reception. We perform some of the same experiments we did for the foil enclosure, to measure the attenuation of artificial interference by the enclosure. We turn on our 910-MHz transmitter and place our receiving antenna 100 cm away. We place the prototype enclosure around the antenna and make adjustments to its lid and walls. Table: Interference Power Received. The receiving loop antenna is 100 cm away from the vertical quarter-wave 910-MHz transmitting antenna. The front side of the enclosure faces the antenna. The prototype enclosure on its own provides roughly 24 dB attenuation of interference. With extra layers of shielding on the sides, we can improve attenuation to 30 dB. Our experiment is not sensitive to further improvements. Table: Message Reception in Prototype Enclosure. We use abbreviations: RA for receiving antenna, TA for transmitting antenna, and enclosure for prototype enclosure. In each experiment, we move the transmitter around at random in the full volume of the enclosure, even touching the sides and floor. 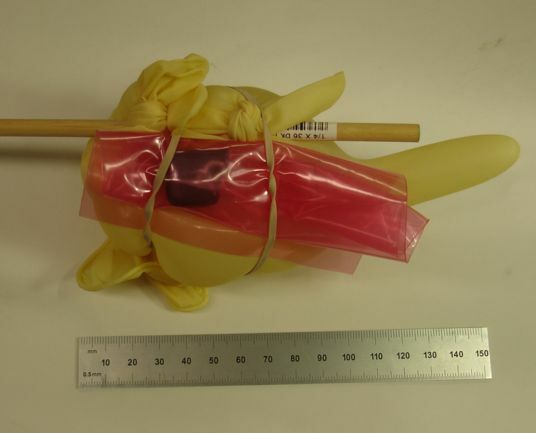 We simulated implanting the transmitter in a rat body by tying a latex glove filled with water to our stick, as shown below. One thing that stands out from our observations is that the receiving antenna performs better at the center of the enclosure than in the corner. [12-JUN-09] Reception is poor inside our Big Enclosure. We observed sharp holes in reception with frequency, which we believe are caused by internal reflections within the enclosure. Today we looked at the reception with frequency for the prototype enclosure. The result is the oscilloscope shots below. Figure: Reception with Frequency. In each shot, top trace is IF in the receiver and bottom trace is TUNE in the modulating transmitter. Top-Left: two loop antennas close together in enclosure, lid off. Top-Right: lid on. Bottom-Left: lid on, antennas arranged to give biggest holes in reception. Bottom-Right: quater-wave transmits to loop, lid on. Although we see holes in the reception with frequency, they are not nearly as sharp nor as deep as those we see in the same traces for the Big Enclosure. 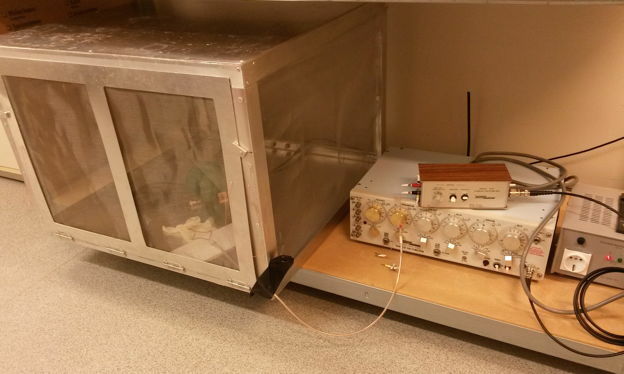 [14-MAY-13] We set up the 910 MHz source 5 cm outside the wall of our Prototype Enclosure and measure power at 910 MHz with the Spectrometer (A3008B). The antenna inside the enclosure is 10 cm from the enclosure wall. We are using veil shield walls, and a resistive sheet described by the supplier as microwave absorbant sheet, even though it is too thin to absorb our 910-MHz radio waves. It does, however, act as a fine reflector. Table: Attenuition by Prototype Enclosure, Revisited. In all cases the antennas are separated by 15 cm. The power source is 910 MHz, +13 dBm into a quarter-wave wire. 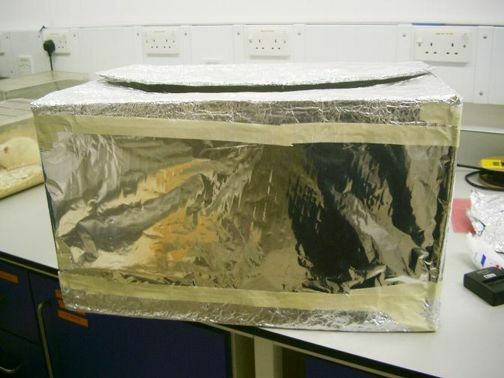 The most effective shielding in the above experiment is the double-wall of absorber wrap on the outside and veil shield on the inside, which gives the same 910 MHz power as when we disconnect the antenna from the spectrometer alltogether. [21-MAY-13] We set up the 910 MHz source 10 cm outside the wall of our Prototype Enclosure and measure power at 910 MHz with the Spectrometer (A3008B). The antenna inside the enclosure is 10 cm from the wall. The floor of the enclosure is filled with AN-75 absorber, black side up and cut to size. We try a selection of materials for the wall between the two antennas. Figure: Attenuition by Various Wall Materials. We give the power received by the antenna, as measured by the spectrometer, for various fabrics placed between them. The rightmost column is the attenuition by the fabric wall, as compared to the power we received with no wall in place. The "Bopp 11523" fabric is made by G. Bopp & Co. AG. It is a 304 stainless steel mesh made of 30-μm diameter wire on a 250-μm pitch, so that 78% of the are is open. This fabric is as light as the veil shield fabric, but stiffer and tougher. It is available in 1.2-m wide (48") rolls and costs $2.72 per square foot. Its performance appears to be better than all other fabrics except the copper taffeta, which is not transparent. The manufacturer of the absorbant sheet specifies "shielding performance" of 28 dB at 1 GHz, and suggests that the absorbing power of the material will "scavenge any RF which might leak in". Our observations (see above and below), however, are consistent with 28 dB shielding through reflection and 0 dB through absorption, which is consistent with the theory of electromagnetic wave propagation and absorption. The thickness of the sheet is too small compared to the radio wavelength for there to be any significant probability of absorption. [05-MAY-09] Pishan at ION (Institute of Neurology) made her own faraday enclosure out of foil and a cardboard box. She placed an animal cage within the foil enclosure. 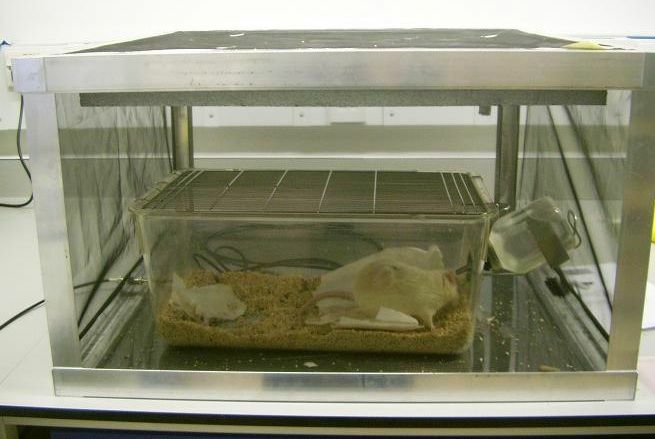 The animal cage contained a rat with an A3013A implanted transmitter. She put an A3015A loop antenna inside the enclosure with the animal and the cage. The antenna was close to one wall, so as to make space for the cage. The cable shield was not connected to the foil around the box. The foil enclosure blocked out all signals from transmitters outside the enclosure. Reception from the transmitter inside the enclosure was 85% in one test and 91% in another. Reception outside the enclosure with these same transmitters was 95% and 80% respectively. Because the antenna is close to a wall of the box, we expect reception to drop from 100% to 90%, as it did when we moved the antenna into the corner of our prototype enclosure. But we expected reception outside the enclosure to be poorer, so as to give a contrast with the reception inside the enclosure. On this day, however, reception from both tested transmitters was good outside the enclosure. We will see what happens on other days. [07-MAY-09] Pishan put the antenna in the center of the enclosure and released each of four animals into the enclosure in turn, like this. We received 0% from transmitters outside the enclosure, except when No12 was in the enclosure and No1 was outside, when we received 14% from No1 through the foil walls. Reception from No12 inside the enclosure was 93%. We saw 100% reception most of the time, but occasional seconds would go by with 0% reception. This loss contrasts with the loss we observe outside the enclosure, where reception is 30% to 90% all of the time. Reception from No10 was 94% in the enclosure, from No9 was 84%, and from No1 was 96%. [10-JUN-09] Today we completed our first large faraday enclosure, which we call our Big Enclosure. The big enclosure is 70 cm × 70 cm × 40 cm, and is large enough to fit two animal cages and their water bottles with room to spare. As in our prototype enclosure, the walls of the bix enclosure are made of VeilShield fabric and its edges are made of 1.6-mm aluminum L-brackets. The lid has been simplified, so that it takes up less height. We describe the construction of the big enclosure in our Assembly Manual. 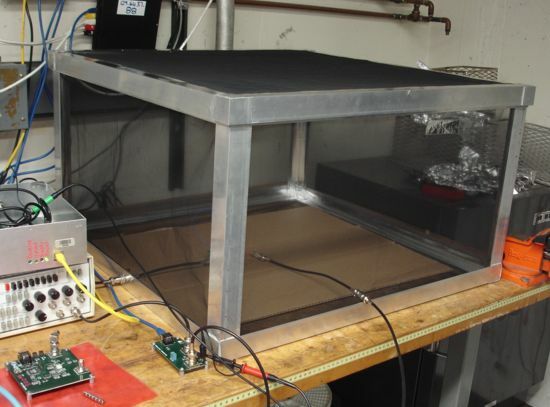 We set up a 910-MHz interference source and obtained the following power at our receiving antenna as we moved the antenna in and out of the enclosure, put on the lid, and sealed up gaps beneath the lid with aluminum slats. Table: Interference Power Received. The receiving loop antenna is 6 m away from the vertical quarter-wave 910-MHz transmitting antenna. With the gaps in the lid reduced with aluminum slats, the enclosure gives a minimum of 20 dB isolation, and with perfect lid adjustment, up to 40 dB isolation. 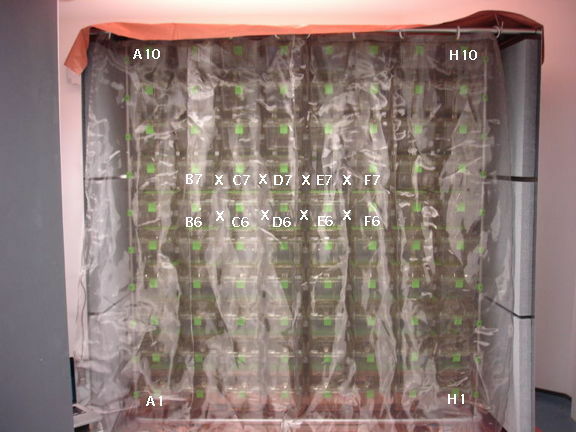 The 20 dB variation in isolation with lid position is affected also by the location of the experimenter's bodies, and contact with the fabric walls. We place a transmitter in the enclosure. We get good reception with the lid off, but when we put the lid on, we get no signal. We move the transmitter. We get a week signal. We continue with these movements and observations, and find that reception inside the enclosure is poor, although it is unaffected by turning on our external 910-MHz transmitter. We supposed that internal reflections in the big enclosure would be less severe than in the prototype enclosure, which was half the length and one tenth the volume. But we appear to have been mistaken. We inserted a second loop antenna into the big enclosure and powered it with our Modulating Transmitter (A3014MT). We sweep the frequency of the transmitter through the 900−930 MHz band. 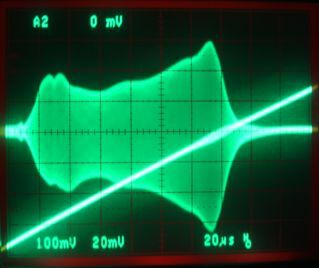 We observe the IF amplitude in our Demodulating Receiver (A3017). This amplitude is proportional to the product of the power received by our antenna and the loss in our SAW band-pass filter. 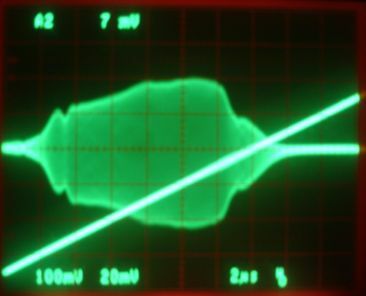 We obtained the following measurements with our oscilloscope. Figure: Reception with Frequency. In each shot, top trace is IF in the receiver and bottom trace is TUNE in the modulating transmitter. Top-Left: no antennas, connection by 30 dB attenuator. Top-Right: two loop antennas close together in enclosure, lid off. Bottom-Left: two loop antennas, lid on. Bottom-Right: quater-wave transmits to loop, lid on. 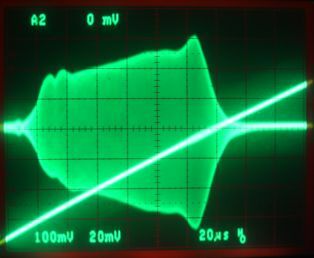 With the 30dB attenuator, we see the response of the SAW filter in our receiver. With the two loop antennas and the lid off, we see a similar frequency response, with no notches. As soon as we put the lid on, the notches appear. As we move the antennas around, adjust the lid, and press upon the walls, the notches move around rapidly, and form complex patterns. Often the notches join up and we get holes in the frequency response. With a quarter-wave transmitting antenna, the holes become more severe. 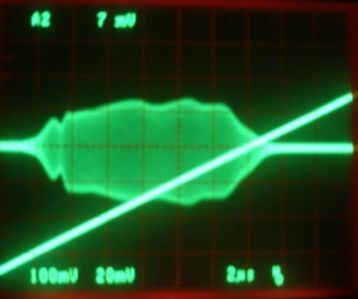 With its highly reflective walls, and its dimensions greater than one wavelength of our signal, the big enclosure is a resonant chamber in which standing waves form as a matter of course, and destructive interference almost always occurs at one frequency or more frequencies in the 900−930 MHz band. We estimate that the narrow reception holes are as deep as 30 dB, so that we are suffering a 30 dB loss of power at one particular frequency because of multi-path interference. We placed baffles made of mosquito screen in the corners of the enclosure. We observed fewer holes in the frequency response, but still enough to compromise reception from our transmitters. All we can do with our reflecting screens is re-direct the waves. But we observe that we get good performance inside the enclosure when we take the lid off. Radio waves leaving the top of the enclosure don't come back, or hardly any of them do. Removing the lid is equivalent to placing a microwave absorber in the lid. We removed the lid and moved a transmitter into all parts of the enclosure, including the corners, and rotated it rapidly and at random for sixty seconds. We obtained 98% message reception. With an absorber in the lid, we would obtain the same performance, so we are confident that such an absorber will solve our reflection problems. 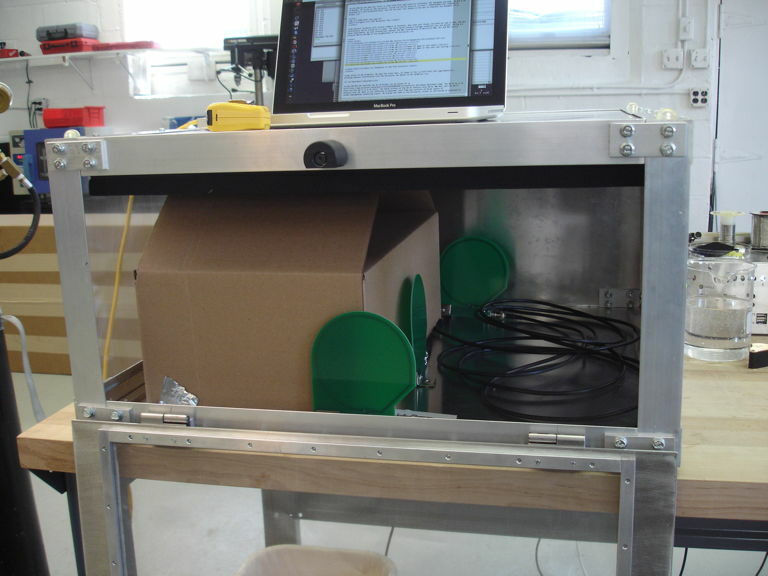 [12-JUN-09] We repeated our interference measurements for the Prototype Enclosure. You will find our observations in the Prototype Enclosure section. We do not see sharp holes in reception with frequency. Our observation is consistent with our claim that it is the sharp holes that destroy reception of our transmitter signals. We conclude that internal reflections, leading to standing waves and other interference phenomena, take place far more easily in the Big Enclosure than the Prototype Enclosure. The Big Enclosure has sides that are a little over two wavelengths long. The Prototype Enclosure has sides that are one wavelength long. [19-JUN-09] We received two 61-cm × 61-cm pieces of Eccosorb microwave absorbant foam. The AN-75 is 3 cm thick and the AN-77 is 6 cm thick. The black surface of the AN-75 reflects only 4% at 900 MHz, and the AN-77 reflects only 2%. What is not reflected is absorbed. Each foam pad consists of three layers of carbon-impregnated conducting layers. We placed the foam in the enclosure, either on the bottom or attached to the lid, and measured reception with a transmitter on a stick for each arrangement. We are delighted with our results. Table: Message Reception in Big Enclosure. In each experiment, we move the transmitter around at random in the full volume of the enclosure, even touching the sides and floor. Some rows are repeat experiments. By default, the antenna is in the center of the enclosure floor. 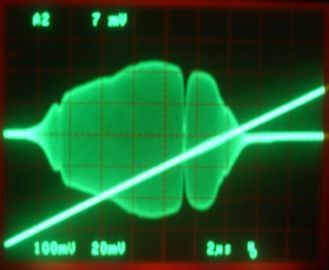 We looked at the reception versus frequency traces on the oscilloscope, and saw no sign of sharp notches or dead spots whenever we had one of the pieces of absorbant foam in the enclosure. We can find orientations when reception across the 902−908 MHz spectrum is greatly reduced, but these reductions can be explained by the relative orientation of the transmitting and receiving antennas alone. We turned on 910 MHz interference power and compared the power we receive inside and outside the Big Enclosure when we have the AN-77 foam sitting on the bottom, with the antenna on the foam at the enclosure center. Received power dropped from −44 dBm to anything between −74 dBm and −80 dBm as we moved the lid around and changed the position of our own body. We conclude that the Big Enclosure, when equipped with absorbant foam, gives us 30-dB isolation. If keeps out 99.9% of all RF power in our spectrum. Reception inside the Big Enclosure is better than reception outside, even when we don't generate our own interference. [25-JUN-09] We glued the AN-75 (3 cm) black side up on the underside of a new lid. The lid does not perform well. We get only 87% reception. We repeat our experiments with the AN-77 (6 cm), flipping it from black side up to black side down. The black side is the conducting side, which is suppose to be the last layer of foam reached by an absorbed wave. Our understanding, and that of the manufacturer of the foam, suggests we will get best performance with the black side facing the enclosure boundary. In previous experiments, we noticed little difference between the orientations. At that time, our test transmitter battery voltage was above 2.5V. But today the voltage is down to 2.3V. With the weaker transmission power, the difference between the foam orientations is clear and repeatable. The enclosure performs better with the black side facing away from the enclosure boundary. We removed the AN-75 from the lid, where it had been glued securely, and placed it in the bottom of the enclosure. We obtained 91% reception with the black side up, and 81% with the black side down. We resolve to glue the AN-77 black side down to the lid, and try again. [29-JUN-09] With the AN-77 (6 cm) glued to the lid, black side down, we get 98% reception from our test transmitter, whose battery voltage is now 2.1V. We will ship this faraday enclosure to ION. [08-JUL-09] We have some microwave aborbant sheet made of carbon fibers. This material is only half a millimeter thick. It costs $30 per square meter. We placed layers of the sheet in the bottom of the enclosure and tested reception. One layer in the bottom improves reception from 64% to 81%. Multiple layers do nothing to improve reception. With one layer of sheet on the bottom and four side walls, we obtain 98% reception. [15-JUL-09] Pishan at ION has implanted transmitter No11 in a rat, put the rat in a plastic cage, and put the plastic cage within a big enclosure we sent to ION by air freight. Over the course of five minutes, with the rat moving around, she obtained an average of 99% reception, with reception of at least 80% of messages during 98% of the three hundred seconds, and a minumum reception during one particular second of 53%. This is the best reception we have ever obtained from a transmitter, implanted or not, in Boston or London. We conclude that the Big Enclosure with the 6-cm absorber is effective. [01-SEP-09] We return from a visit to ION. Reception from two animals in a single faraday enclosure remains perfect. You can see the two animals here. Pishan tells us she would like the enclosure to be 10 cm shorter so that she can lean into it more easily. The back side of the lid has broken off and remains held in place by aluminum tape. The glue joints broke on both sides and the small brackets fell off. We fixed a hole in the mesh walls with tape. [27-MAR-15] We receive 10 of ML-10052-25 from Arc Technologies, specialists in microwave absorbers. We place a 24" square piece of the abosrber on the floor of a Big Enclosure (FE2A) and measure reception from a moving A3028E transmitter on a stick. Our Data Receiver is an A3027D. Table: Message Reception in Big Enclosure with Antenna Centered. In each experiment, we move the transmitter around at random in the full volume of the enclosure, but avoiding touching the walls. By default, the antenna is in the center of the floor. Interference in our office is powerful and intermittent, so we repeat our measurements. It looks like the ML-10052-25 performs better with the darker side facing the inside of the enclosure, which is the side with the identification letters on it. The AN-77 performs better with the darker side facing the outside of the enclosure. The AN-77 identification letters are on the lighter side. In both cases, the identification letters are visible in the optimal orientation. Average reception with the identification letters visible is 98.0% for ML-10052-25 and 97.3% for the AN-77. [08-JUL-09] Our hope is that we can connect multiple faraday enclosures to a single receiver, by combining the signals received from the antenna in each enclosure. We connected our Big Enclosure and our Prototype Enclosure to a single Data Receiver (A3018). In the Big Enclosure we had an AN-75 foam absorber, black side up in the bottom. In the Prototype Enclosure we placed a single thickness of microwave absorbant sheet (but note that this material does not actually absorb microwaves, because it is too thin to do so). We moved a transmitter around in the Big Enclosure and kept a transmitter in the Prototype Enclosure in a jar of water. We tried various ways of combining the signals. Table: Message Reception with Two Enclosures. We move a transmitter around inside the Big Enclosure and leave another transmitter stationary in a jar or water in the Prototype Enclosure. The results with no attenuators, just a T-junction joining the two antenna cables, and outside interference at 910 MHz, are varied. We obtained between 37% and 81% reception. But the improvement in reception with attenuators in the presence of interference is significant. We obtained 94% reception from the moving transmitter with 12 dB attenuators and −40 dBm interference. [09-SEP-09] We combine the antenna signals with the help of a Four-Way Antenna Combiner (AC4A), which consists of a ZB4PD1-2000 four-way power combiner and two BTRM-50 fifty-ohm terminators, all from Minicircuits. The transmitter in the jar in the prototype enclosure has been running continuously since 08-JUL-09, and it's battery voltage has dropped to 2.2 V. We are not surprized that reception drops to 93% in the presence of interference. But the transmitter in the big enclosure has a brand new battery. Reception is 100% even with interference. The advantage of the combiner is that signals from one input do not travel out along the other inputs. Each antenna is isolated from the other, even as their signals are added in the combiner. There is a power loss of −6 dB in a 4-way combiner, but our eariler experiments revealed that attenuation of up to 12 dB does little to degrade reception. We package the combiner, two terminators, and a 30-cm BNC cable in our Four-Way Antenna Combiner (AC4A). Connect two or more antennas to the input sockets on the power combiner. Cover any unused sockets with terminators. Connect the output socket on the combiner to the receiver input. [05-NOV-09] We assist with the completion of an FE2B enclosure at ION and set up two cages with an antenna combiner. There are two animals in one cage and one in another (No6, No14, and No5 respectively). We place two transmitters in bags upon the floor of one cage (No1 and No2), to assure a weak signal, and a third on top of a cage (No3). Transmitter No6 has been showing problems with reception for some time. We obtain the following graph. We see that the combination of two cages is effective. [07-DEC-09] At ION, reception from two enclosures with the AC4A has been poor, as you can see in the second table of the Trials section in Flexible Wires. Some transmitters show average reception of 50%. Today, Pishan connected one enclosure at a time to a Data Receiver (A3018) and reception rose for all transmitters to 98% or higher. We resolve to repeat our experiments with antenna combiners in our own lab. Table: Message Reception with One or Two Enclosures. We move a single active transmitter around inside the Big Enclosure. If other transmitters are active, they are stationary. Cables are 240 cm from enclosure to combiner or receiver. Others are 30 cm. In these tests, we introduce the exploration of "corners and walls" of an enclosure as compared to the "entire volume". In the past, we have explored the entire volume, spending only a quarter of the time close to the corners and walls. In our new "corners and walls" tests, the transmitter spends its entire time touching or almost-touching the corners and walls. Thus we obtain a more conservative measure of signal loss. 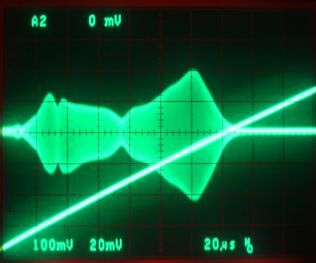 The RF amplifier in the Data Receiver (A3018A) has a tendancy to oscillate. We try two receivers: Q0126 and P0193, to see if one of them will show instability with the antenna combiner. But both receivers perform well. We see the faraday enclosures isolating the transmitters from external −40dBm interference. When we remove the lids, reception drops to zero. With the −40dBm removed, reception is good with the lids off, although we see evidence of bad messages from ambient −68dBm interference. When we have multiple transmitters, two are in the second enclosure. Thus We cannot reproduce the poor reception observed at ION. [21-MAY-09] We measure the mains hum on free-floating transmitter leads inside and outside our prototype faraday enclosure. We see 2 mV p-p hum outside and less than 20 μV of hum inside the enclosure. When we put the enclosure's lid on, we see the following signal on the transmitter's X input. We conclude that the faraday enclosure gives us a factor of 100 drop in mains hum amplitude, or 40 dB attenuation. [24-MAY-13] The Design and Engineering facility at the Institute of Neurology (ION) has designed and built a front-loading version of our big enclosure, which we will call the FE2C. The photograph below shows a single FE2C at ION. Figure: The FE2C Enclosure, Built at ION. The walls are veil shield mesh, as in the FE2B. Glued to the lid is an AN-77 absorber (see Absorbers) with the gray face exposed, in accordance with the manufacturer's instructions. Jon Henton of ION tells us that the absorbers, which he ordered directly from the manufacturer, came with an adhesive backing on the black face. The front face is hinged along the bottom edge to make a door. The door is held firmly in place by two locking nuts on either side. When open, the door is held horizontal by a wire. This design has been in use at ION for almost a year, and provides reliable reception. The great advantage of the front-loading enclosure is that they may be stacked upon one another, as shown here. The five-enclosure stack is on wheels so that it may be rolled around the animal laboratories. All parts were purchased, machined, and assembled at ION without assisstance from OSI. 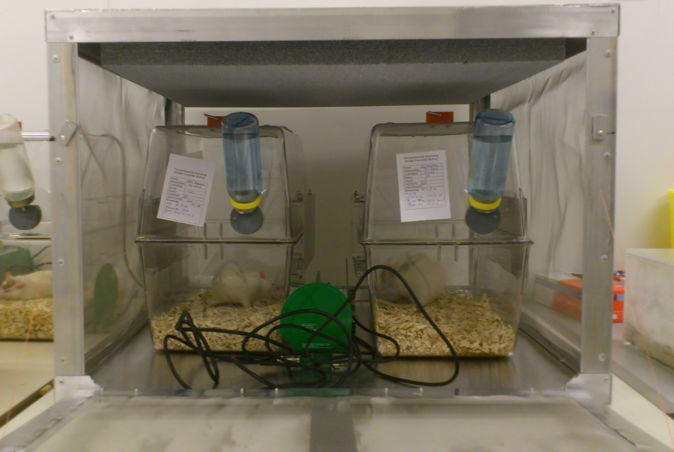 [15-JAN-15] We receiver recordings from four rats in separate cages in an FE2E enclosure at Philipps University, Marburg. They recorded with two, three, and four antennas connected to a Data Receiver (A3027C). Reception was as follows. Table: Reception in the FE2E, Average During Five Minutes. There was no single one-second interval in the entire 5-minute recording with 2, 3 or 4 antennas during which reception dropped below 80% for any one of the four channels. Thus robustness of reception was 100.0% for 2-4 antennas. [15-APR-15] We have our first FE2F front-loading enclosure, OSI designed and made. It has a front door with no straight path into the interior when closed. The mesh walls are glued in place with a frame, so they are taught. The corners are bolted together. It provides three antenna feedthroughs. We put a 25 cm × 41 cm box in the enclosure. Inside the box we place an A3028E attached to a self-propelled ball, and let the ball roll around in the box to simulate the movement of an animal. We measure reception with various numbers of antennas, door open and closed, and with our own 13 dBm, 910 MHz interference source turned on 4 m away. The table below presents average reception over one minute. During all these experiments, we have intermittent ambient 926-MHz interference of −55 dBm. Our 910 MHz source produces −50 dBm in the neighborhood of the enclosure. 1 Closed On 80.9% Taped all gaps in rear walls. 1 Closed On 80.1% Taped all gaps in rear wall and ceiling. Table: Reception in the First FE2F Enclosure. 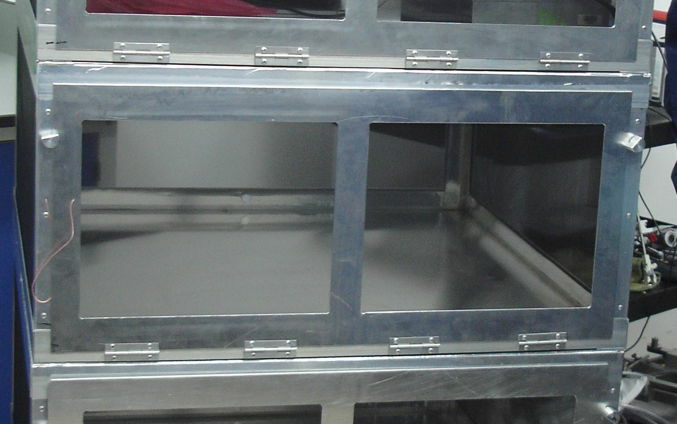 [01-JUN-15] We have another FE2F enclosure. We set up the same reception test described above, with a moving transmitter in a dry box. We measure the 910 MHz power picked up by an antenna inside the enclosure with the door open, and get −45 dBm. We close the door and get −80 dBm. We disconnect the antenna and get −83 dBm. We open the door in stages, and measure power received inside the enclosure with the width of the opening between the lid and the frame. Figure: Isolation versus Door Opening for FE2F. We define zero isolation as that provided when the door is fully open. Compared to the door open, the door closed gives 35 dB isolation. With a 1-mm gap isolation drops to 30 dB. These measurements allow us to estimate the effect of a loose door, or of forcing the door open a few millimeters in order to allow an additional cable to enter the enclosure, like this. [15-SEP-15] We close the door of our FE2F, sealing the antennas inside. We move an A3028E transmitter around outside. We receive 0.0% of its messages. When we place the transmitter inside the enclosure, we receive 100%. [03-APR-18] We have our first FE3A enclosure. We place two antennas inside and obtain 98-100% reception from an A3028E taped to a toy rolling around on the metal floor. With the door open we see −41 dBm of interference at 930 MHz. With door closed, this peak drops to −63 dBm, giving us 22 dB of isolation. [16-OCT-12] We are presented with a new reception problem: we want the ISL to receive 146-MHz commands from an antenna outside the animal, while at the same time transmitting 910-MHz message to additional antennas outside the animal. The 146-MHz signal has wavelength 2 m. An effective, omnidirectional antenna is roughly 30 cm high, so that it will almost touch ceiling and floor of the enclosure. Under such circumstances, we expect severe multi-path interference. We propose to use a single 146-MHz command antenna on a laboratory table. Our hope is that the single 146-MHz transmission will be powerful enough to be received reliably by all ISLs on the table. At the same time, we will distribute about this table eight independent 910-MHz data antennas. Our hope is that the transmission from any one ISL or SCT will be received correctly by at least one of the eightantennas. 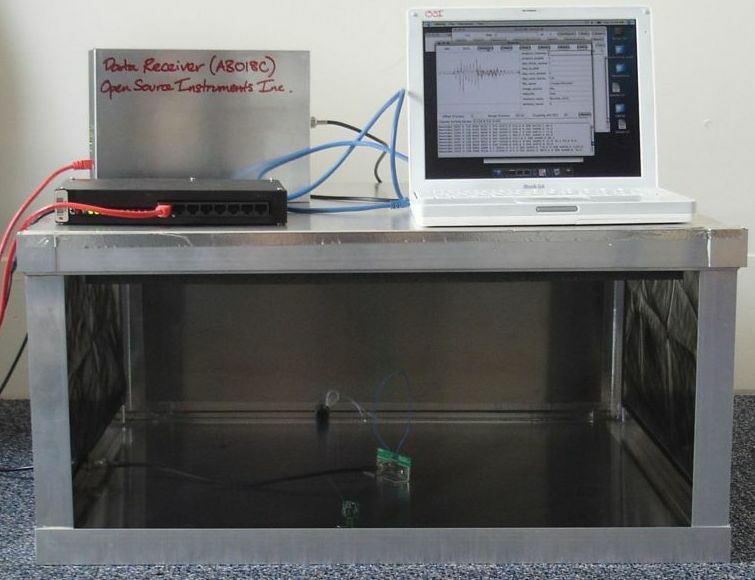 This single-table transmitter system must at the very least be isolated from other ISL or SCT systems on nearby tables. At the same time, an isolating faraday enclosure will provide immunity to unknown quantities of external interference. We propose to try out the faraday enclosure shown below. The canopy is rather like a mosquito net, made out of RF reflecting fabric. Beneath the canopy we propose to install an RF absorbing mat that will serve both to block incoming RF and to dampen the reflection of internal RF. Figure: A Canopy Enclosure. The canopy is made out of conducting, transparent fabric. The base mat is made out of microwave absorbing sheet, if such can be found. [30-NOV-12] We purchased a variety conducting fabric from LessEMF.com. We set up our laptop to measure power received from our home wireless router. We wrapped it in various fabrics. 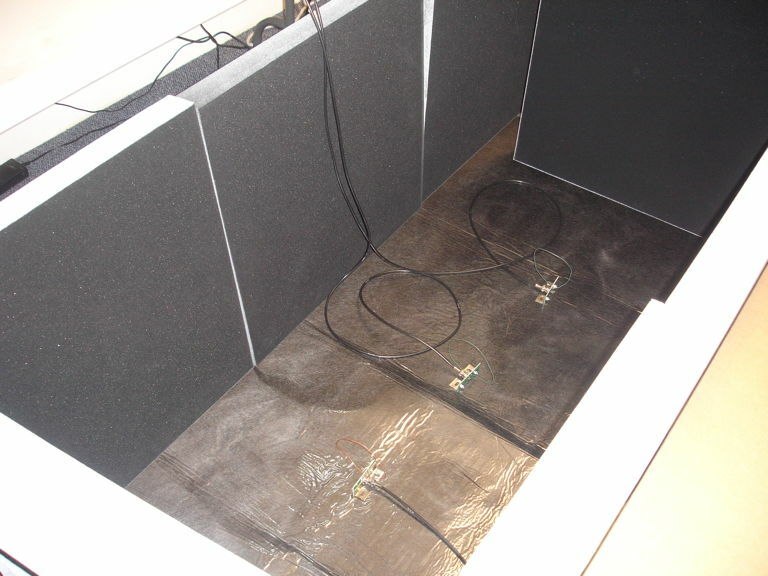 We placed a base underneath of microwave absorber and covered it with various fabrics. Table: WiFi 2.4-GHz Power Loss Due to Shielding. The attenuition of 2.4 GHz by the shielding may be far greater than the power loss because the router can increase its output power to compensate for a poor connection with the monitoring laptop. The wrap-around with folded sides made of the Wall-Shield foil gave us a 20-dB drop in received power. This observation is inconsistent with our past experience with foil as a reflector of RF power. We included some resistive sheet within the wrap-around and this did nothing to improve isolation. We suspect that the router is increasing its output power when we wrap the lap-top, thus obscuring the isolation provided by the fabric. Nevertheless, we conclude that the SwissShield Daylight fabric will be sufficient to give us a 15-dB isolation at 2.4 GHz, which is what is suggested by its data sheet. At 1 GHz, we can hope for 20-dB isolation when combined with the same resistive sheet as a base mat. The canopy must provide some degree of isolation from mains hum. Our existing steel and aluminum faraday enclosures, with their connection to the antenna cable shield, provide 40 dB isolation from mains hum. As a result, we see no observable mains hum in our EEG recordings. This greatly facilitates EEG analysis, because we don't have to worry about mistaking mains hum for neurological activity. Fabric that provides isolation against RF may not provide isolation at mains hum frequencies (50 Hz, 60 Hz, and their first few harmonics). 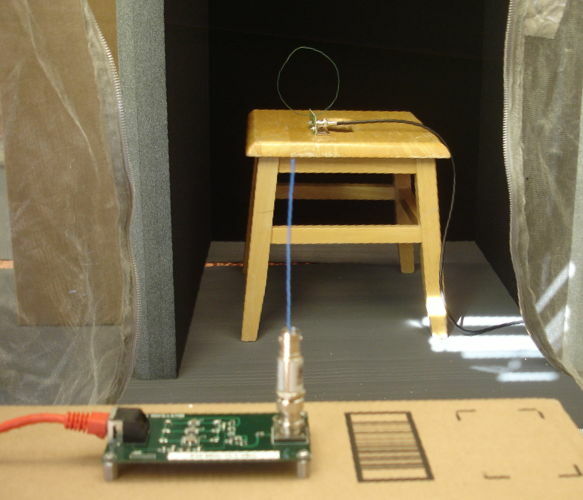 We placed a transmitter and antenna in a box on a table, with an AC power cord running nearby. We experimented with various fabrics and enclosures. We placed fabric over the power cord but under the box. We wrapped the box in fabric. We measured the amplitude of mains hum in each case. Table: Mains Hum Isolation by Fabrics. We see that wrapping our transmitter in fabric that is not connected electrically to the coaxial antenna cable's shield causes an increase in mains hum. The SwissShield Daylight fabric uses strands of copper coated in cotton. Its surface is non-conducting. We will not be able to connect it to a cable shield. The Canopy Mesh Fabric, on the other hand, has a metallic surface and is a fine conductor. The resistive sheet is not conducting upon its surface, but if we peel back the thin plastic coating, we get to the carbon fibers that constitute the absorber. The resistance of the carbon layer is roughly 3 Ω per square. We plan to make a conducting enclosure out of mesh fabric and resistive sheet. [24-JAN-13] We erect the first Faraday Canopy, shown below. The walls and ceiling are made of canopy mesh fabric. The base is made of a layer of resistive sheet, called microwave absorbing sheet by its manufacturer, on top of a layer of kitchen foil. The conducting walls, ceiling, and base reflect incoming microwaves. The resistive sheet we hope will absorb microwaves that manage to penetrate the conducting enclosure. Figure: The Prototype Canopy Enclosure. Within the enclosure is its designer and creator, holding the first Implantable Lamp (A3024Y). The lamp is flashing in response to 146-MHz RF power emitted by the half-wave antenna in front of her. To get a better idea of the size and shape of the enclosure, we invite you to view the following short video. Figure: Movie Showing the Canopy in the OSI Office. The movie is an mpg file, which Microsoft Windows won't play for you unless you install an MPG player application. We tucked the base of the canopy under the black resistive sheet so as to make a fragile but effective contact between the walls and the aluminum foil of the base mat. We placed a few extra pieces of black resistive sheet within the enclosure. We ran the cable of our RF spectrometer into the enclosure and tried to get an idea of how effective the enclosure was at blocking external interference in the 900-930 MHz band. Figure: Peak Power Spectra Within and Outside the Enclosure. We use the RF Spectrometer (A3008C) to make our measurements. The vertical scale is logarithmic received power, −100 dBm to −20 dBm (0.1 nW to 10 μW) with 10-dB marks. The horizontal scale is linear frequency 880-950 MHz with marks every 5 MHz from 900-930 MHz. With no antenna we get a trace along the −80 dB line. Green: antenna in enclosure. Blue: antenna outside enclosure. Pink: outside at 3-m range with 910-MHz interference source turned on. Yellow: antenna inside the enclosure at 2-m range. Red: antenna inside the enclosure at 2-m range and double-layer of black resistive sheet. We see cell-phone interference in the 860-900 MHz band. The enclosure appears to give us around 12 dB of isolation to these signals. There is a peak at 927 MHz that is hardly attenuated at all by the enclosure. We generate 910 MHz with a SAW Oscillator (A3014SO). With the antenna at 3 m outside the enclosure we receive 7.0 dB more power than with the antenna at 2 m inside. The difference suggests the enclosure offers 10 dB of isolation at 910 MHz. Our FE2B enclosure gives us 30 dB isolation. According to the manufacturer's data sheet, the canopy mesh fabric should provide over 40 dB of reflection loss at 900 MHz. Our foil enclosure gave us 28 dB isolation, so we know that our foil base layer must give us at least 28 dB reflection isolation. Our base has in addition a layer of absorbant sheet which we know from our own measurements above will give us 30 dB isolation at 2.4 GHz, and from the data sheet should give us 27 dB isolation loss at 1 GHz. We note that this sheet does not isolate by absorbing, despite the manufacturer's claims, but rather by reflection. Let us suppose that 99% of external 910-MHz power reflects from the sides of our canopy. The remaining 1% enters and reflects from the walls. Upon each reflection, it loses only 1% of its power, so ten reflections will hardly alter its strength. If ten reflections are likely, then the same RF photon will have ten chances to interact with our antenna. Only 1% of RF power enters, but it is ten times more likely to be detected. Thus our isolation is 90% rather than 99%. [30-JAN-13] We apply 32 dBm of 146 MHz to a vertical half-wave antenna on the floor of the canopy. We check reception with a tuned A3024A Implantable Lamp. We obtain 100% reception throughout the enclosure. We drop the antenna power to 10 dBm and obtain 100% reception except when we bring the A3024 loop antenna within a few centimeters of the absorber on the floor, with the coil oriented in a vertical plane facing the transmitting antenna. We restore 32 dBm to our antenna and move the A3024A receiver outside the enclosure. At range 10 cm from the wall, reception is roughly 50%, which is far inferior to reception we obtain on the other side of the wall at almost the same range from the antenna, but with 22 dB less power transmitted. This observation suggests that the walls of the enclosure are providing at least 22 dB isolation at 146 MHz. 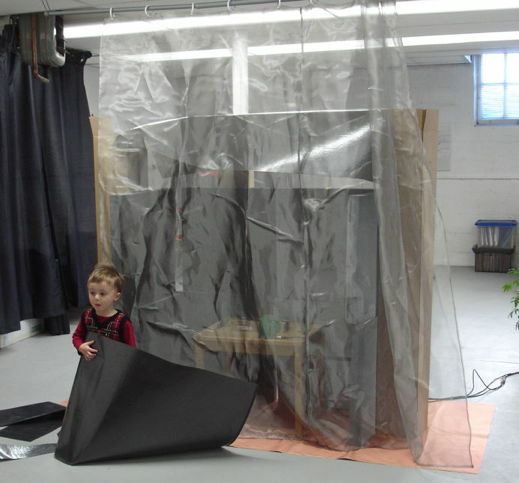 [13-MAY-13] We have added a floor of copper taffeta fabric and a door made with zippers. The Canopy Enclosure is now a Tent Enclosure. The tent is a complete, conducting enclosure when the zip door is closed. We add two socks to bring in cables. Each sock is 50 cm long and 10 cm in diameter. Its outer surface is canopy mesh fabric and its inner surface is absorbant sheet (which does not in fact absorb, but merely reflects, although we had not come to this realisation at the time we performed this experiment). Inside, we hang two panels of the same black sheet from the back and side walls, each panel 1 m wide and 1.5 m high. We use our spectrometer to measure the power picked up by an antenna in the tent. Figure: Peak Power Spectra Within and Outside the Faraday Tent. Blue: antenna disconnected. Red: Antenna connected. The bump at 925 MHz is −70 dBm. Green: Transmitter near antenna. The interference at 925 MHz has power −60 dB outside the tent and −70 dBm inside. If we turn on our 910 MHz reference source, we get −30 dBm at range 3 m with the tent dooer unzipped and held open. With the door zipped shut we get −40 dBm. Both measurements are consistent with interference attenuition of 10 dB. 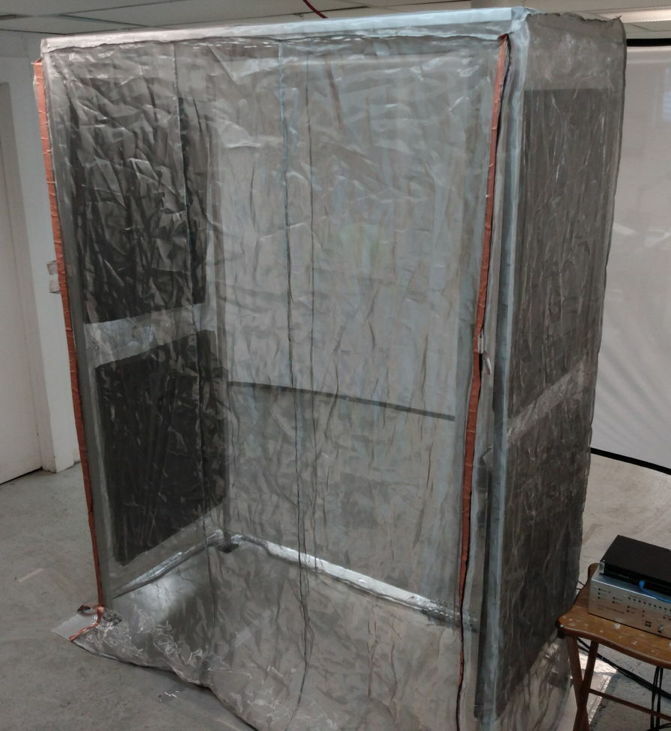 We take out our Prototype Enclosure and place it around the antenna inside the Faraday Tent, with the tent door open, and one layer of so-called absorbant sheet on the floor of the Prototype Enclosure. We get −48 dBm. We add a bundle of folded so-called absorbant sheet to the Prototype Enclosure and get −58 dBm. We take a A3013P transmitter with a bent-wire antenna and an external battery and test reception inside the Faraday Tent over one-minute periods. With the transmitter next to the antenna we get 98.5% reception. We move at random throughout the tent, at ranges up to 2 m, and obtain 75%. At ranges up to 35 cm we get 89%. We repeat at 35 cm and get 83%. We add an A3021B active antenna combiner to the signal path and get 85% for ranges up to 2 m. We turn the WiFi off and get 87% up to 2 m. We turn phones off as well and get 84% up to 2 m and 91% up to 35 cm. In this last test, robustness is 88%. [21-JUN-13] We set up the canopy with two anti-static mats covering the floor. With the weight of the mats holding down and extending the floor, the canopy hangs well from the ceiling and is spacious inside. We run a coaxial cable through the floor-level cable sock and tape the cable shield to the conducting floor. Figure: Interior of the Canopy. Rubber anti-static mats on the floor. Three AN-77 absorbers, gray side out, lean against the Canopy Mesh Fabric back wall. The floor under the mats is Copper Taffeta Fabric. We have six AN-77 Eccosorb absorbers to use in our experiments. We begin by placing three against the back wall, black side facing the interior. We place the pick-up antenna of a Data Receiver (A3018C) on a stool in the center of the enclosure, as shown above, and Subcutaneous Transmitter (A3018A) No23.3 on the stool while we move around the interior of the enclosure. Reception is over 99.%. We hold 23.3 in one hand and move it back and forth along the wall of absorbers, rotating and translating at 0-50 cm from the wall. The transmitter is 50-150 cm from the antenna. Reception is 76%. We repeat with un-encapsulated transmitter 24.5 and obtain 64%. Meanwhile, 23.3 on the stool gives 99.6%. We place the stool up against the absorber wall. The antenna is 30 cm from absorber surface. We hold 23.3 and move it 0-30 cm on either side of the antenna, as if there were animal cages on either side. Reception is 95%. We add three more absorbers along the side wall, also black side facing the interior and repeat. We get 93%. Rotate all six absorbers so gray side faces interior and repeat experiment 0-30 cm from antenna. Get 97.3%. Remove the three absorbers on the side wall and get 96%. Return antenna to center and move 0-50 cm from wall, 50-150 cm from antenna, holding 23.3. Get 80%. Restore the three absorbers to the side wall, gray side facing interior, and get 87%. We place our 910 MHz +13 dBm source outside the zip-door of the canopy. The spectrometer antenna is on the stool in the center of the room. The antenna cable runs into the enclosure through a sock and is grounded by aluminum tape. We measure the attenuition of the 910 MHz power as we open and close the zip door. We arrange the absorbers in various ways along the back and side walls, and behind the antenna. We unplug the antenna and the antenna cable from the spectrometer to obtain a background. The canopy appears to provide no more than 6 dB of isolation. [24-JUN-13] We return and bring the entire spectrometer and antenna cable into the canopy, running a single shielded LWDAQ root cable out to the LWDAQ Driver. We move the 910 MHz source to a place 50 cm outside one of the side walls, away from the zip door. We place the antenna on a stool 50 cm inside the wall. The difference in power with and without the zip door open is only 5 dB. We make a five-sided cube around the antenna, with the single open face against the enclosure wall. Isolation is now 23 dB. With only a single absorber behind the antenna we get 7 dB. 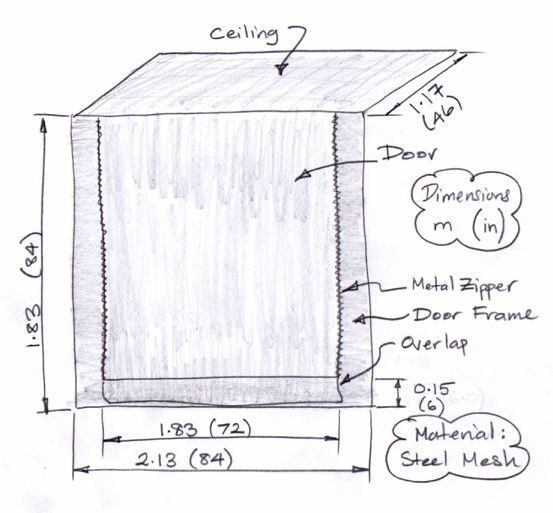 Adding top, bottom, and two side walls to the absorber cube attenuates by 16 dB, which suggests that 97.5% of the power reaching the antenna is reflected off the canopy walls. [15-AUG-13] Catherine Hills, vetinary doctor at ION, has tried passing the air flow in and out of an IVC rack through fine stainless steel mesh, a sample from BOPP. She reports, "Just to update you on the material I tried on the IVC rack. Unfortunately the material held the dust created from the cages, therefore with this building up it will make the motor unit work harder to achieve the correct air changes and removing the CO2 and ammonia. It will also increase the temperature and humidity within the cages, therefore we would have to cut the material around the pipes to ensure the environment of the cage is kept within the correct parameters." So we must allow pipes to enter and leave the enclosure, or we can opt to include the pumps and pipes within the enclosure, in which case we will have to determine how much mains hum these pumps will add to the EEG we recrod. 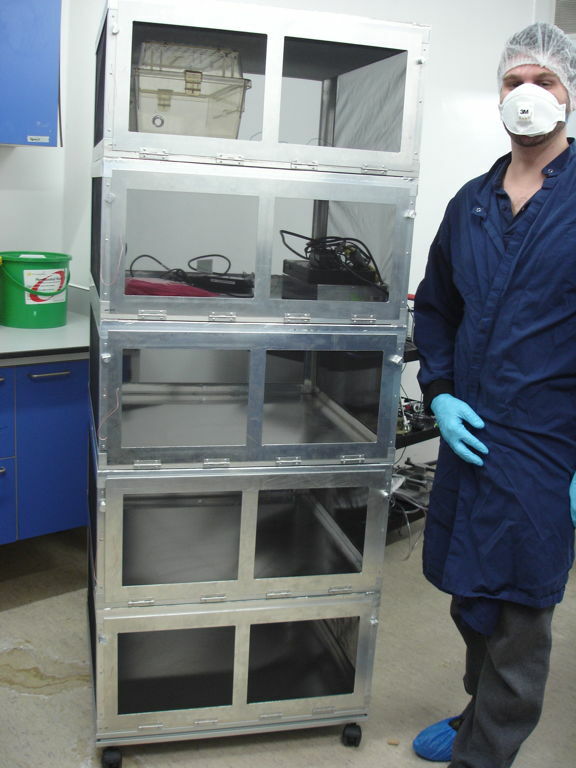 [19-SEP-13] We set up our Faraday Canopy and place within it three towers of microwave absorbers. Each absorber tower is 60 cm wide and 180 cm high, made of three 24-inch square AN77 foam absorbers. We arrange these along the back wall of the enclosure and turn on our 910 MHz +13 dBm interference power source. We run an antenna cableinto the Faraday Canopy through a sock to measure penetrating 910 MHz. We have the 910 MHz source just outside the zip door of the canopy, on a box, and the spectrometer antenna 1 m away inside the enclosure. The following paragraph is transcribed from our notes, and shows that our canopy with rear wall of absorbers appears to give us at least 10 dB, and most often 20 dB of isolation form external interferrence. Spectrometer outside enclosure, no antenna cable, 910 MHz source powered up but no antenna wire inserted, -74 dBm in spectrometer. Cable 92" x 2 into enclosure through sock -59 dBm. Ground cable union to floor with tape -72 dBm. Open zipper, insert 910 MHz antenna, 1 m between antennas, -32 dBm. Close zipper, have three absorber towers on back wall, get -47 dBm. Patch two 10-mm holes next to zipper, -52 dBm. Arrange towers as triangle (see here), -54 dBm. Open zipper, -35 dBm. Remove absorbers from enclosure, zipper open -31 dBm. Close zipper -42 dBm. Make box of absorbers around spectrometer antenna (see here) and zipper open -32 dBm, close zipper -49 dBm. Repeate triangle behind, zip open -36 dBm, zip closed -44 dBm. Make absorber wall at rear zip closed -47 dBm, zip open -30 dBm. Wall towers touching one another at rear wall, zip open -37 dBm, zip closed -48 dBm. Now Kirsten moves around the enclosure with the zip closed, and power varies from -57 dBm to -44 dBm depending upon where she stands. Swap right side absorber tower position with Kirsten's position, -42 dBm. Kirsten leaves enclosure -43 dBm. Wall at back again, zip closed K out -48, K in -46, zip open Kout -34 dBm. Absorber triangle again, Kin zip open -39 dBm, Kout zip open -37 dBm, Kout zip closed -43 dBm. Pushing on canopy walls and pulling, -42 dBm to -46 dBm. Spaced absorber towers at back, K in zip open -48 dBm, K out zip open -41 dBm. K out zip closed -46 dBm. Kin zip closed -43 dBm. Taped more holes K out zip open -37 dBm, zip closed -45 dBm. Close-up absorber wall at back, Kin zip closed -61 dBm, Kout zip closed -47 dBm. Tape over more holes -51 dBm. Towers around spectrometer antenna. K in zip closed -57 dBm, Kin zip open -44 dBm. Kin zip closed -61 dBm. K in zip open -45 dBm. K in zip closed -52 dBm. Now we move the antenna off to one side, and our observations become confusing. The isolation of the enclosure depends upon the direction of the incoming interference. Isolation could be as low as 6 dB. That's useful, but does not solve our interference problems. [01-JAN-14] For a discussion of the precautions necessary to provide better shielding with a conducting canopy, see Practical Shielding. In order to obtain >20 dB isolation with such a canopy, we would have to make sure that all our seams and doors were conducting surfaces interrupted by gaps of no more than a few millimeters wide. Instead of socks to allow pipes and wires into the canopy, we would have to insist upon bulkhead feedthroughs of shielded cables. Our box enclosures work well because their seems are taped-over and inflexible, and we use BNC feedthroughs. These precautions would make our proposed canopy impractical for animal experiments. As it is, we have seams and zips that may be acting as slits that resonate at our operating frequency in combination with our pick-up antenna, and cable shields entering the canopy that may be acting as dipole antennas in compbination with the canopy mesh. These may be the reasons why our canopy performs so poorly. [28-FEB-14] We set up the faraday canopy in our new office. Ambient 902-930 MHz interference peaks at −43 dBm on our work bench. It enters via the roof and windows only, because we are in a basement. We place three antennas inside the cage, one on the floor and two on a box. We tape the shields of all three cables to the copper fabric floor of the canopy. Interference peaks at −61 dB, −52 dB, and −64 dB on the floor, box, and box. [19-SEP-13] Instead of a Faraday Enclosure, which works by reflecting incoming radio waves with conducting walls, we now consider making a different type of enclosure, one that provides isolation through interior absorbers and some exterior reflectors. The idea is to reduce the number of radio-wave photons entering the enclosure by a factor of ten or a hundred, and then either absorb or release these photons before they have crossed the interior of the chamber more than a couple of times. We place our spectrometer on a stool 1 m from our 910 MHz source. We have no antenna in the spectrometer, but we do have an antenna in the transmitter. We see -65 dBm of 910 MHz. We add the antenna to the spectrometer and see -41 dBm. We place a 60-cm square absorber between the two, we get -48 dBm. Remove absorber, back to -41 dBm. We repeat this experiment in various ways. We find that the gray face of the absorber, when facing the transmitter, provides around 7 dB of isolation, while the black face provides only 5 dB. [20-SEP-13] We arrange three antennas in a row, at 30-cm intervals, with their loops coaxial. We connect each antenna to its own independent amplifier and demodulator in our prototype Data Receiver (A3027). Ambient interference is −48 dBm in the 900-930 MHz band. We hold an A3019D transmitter in our fist. We rotate and translate the transmitter in the 30-cm cube between the left and center antennas. We obtain 96.5% reception. We disconnect the left and right antennas. We obtain 38% reception from the single, center antenna. 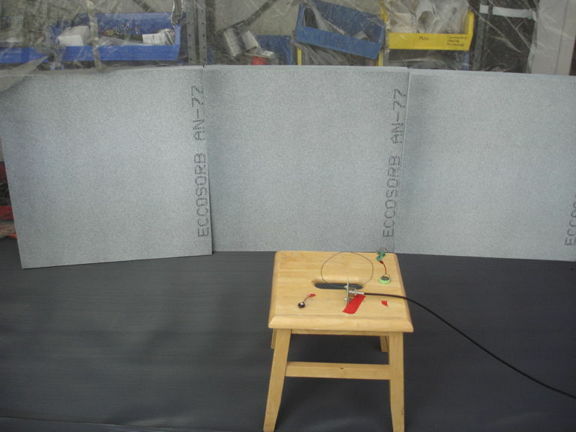 We now lay down a mat of resistive sheet, and create walls of AN77 microwave absorbing foam, as shown below. Figure: Absorbing Coffin. There are three antennas in the base. The floor is microwave resistive sheet. The walls are AN77 foam absorbers. Within this open-topped coffin, we obtain 99.3% reception with all three antennas connected, moving the transmitter between the left and center antennas. [24-SEP-13] We propose to try the following arrangement at ION at the end of October. Behind the rack stands wall of 3×3 AN-77 absorbers backed with aluminum. Two smaller walls of 1×3, also backed with aluminum, stand on the sides. A reflecting curtain of steel mesh hangs in front of the cages. A rubber mat hides a sheet of reflecting fabric beneath. The top of the rack is open, other than the metal that forms its frame and ventilation system. Figure: Absorbing Enclosure for IVC Rack. This enclosure is designed to work with eight independent antennas arrange on the shelves. The absorber walls are backed with aluminum, with the gray side of the absorber facing away from the aluminum and towards the animal cages in the rack. Of the900-MHz power incident upon the gray surface, roughly 90% will be absorbed on its way to the aluminum reflector, and 80% of what remains will be absorbed on its way out again, so the total absorbtion of the aluminum-backed will be 98.2% (the AN-77 data sheet specifies −17.5 dB reflection at 900 MHz). The conducting wall below and in front of the rack serves to reflect interference away from the rack, and also to keep SCT signals inside the rack, where they can be picked up by more distant antennas. The ceiling is open so that multiple reflections of waves between the ceiling and floor are unlikely. The figure below shows an arrangement of antennas in the rack. Figure: Antennas Arranged on IVC Shelves. Horizontal spacing a and vertical spacing b. Absorber walls behind, left, and right. Reflecting curtain in front and reflecting mat below. Ceiling is open. Using the dimensions in the figure above, let us suppose a = b. A transmitter at the center of one of the four central cages will have two antenna within 0.5 a and another two within 1.1 a, as well as others even farther away. A transmitter at the outer edge of the top-right or bottom-left cage will have two antenna at range 1.0 a and one at range 1.4 a. We expect the top-right and bottom-left cages to have the poorest reception. Suppose a = 30 cm. In our office, with ambient interference of −48 dBm and no radio-frequency enclosure of any kind, reception from a transmitter buried in one hand is roughly 50% and at 50 cm it is roughly 25%. At ranges up to 120 cm, it is at least 10%. Assuming reception is independent for eight antennas, and considering the arrangement above, we would expect with these values a combined reception to be 89%. Now suppose that within our IVC rack, with our absorbers and reflectors, we reduce ambient interference by 6 dB, thus doubling the range at which a transmitter can dominate interference. We also convey our transmitter signal more effectively to the more distant antennas. Suppose reception we get 75%, 50%, and 20% at ranges 30 cm, 50 cm, and greater respectively. Combined reception should be 99%. [31-OCT-13] In Pishan's recording room in the Anatomy Building of UCL, we obtain robust reception from a transmitter held in one fist at range 50 cm from a damped loop antenna on a table with no faraday enclosure and no foam absorbers. On the same day on the tenth floor of the ION building of UCL, we cannot obtain robust reception without a faraday enclosure, even when we place the transmitter on the floor next to an antenna. The Anatomy Building is made of brick. Pishan's recording room has 20-cm of brick on all four wall, has the ground below, because it is on the ground floor, and what we guess must be a plaster-coated wood ceiling. Brick provides roughly 1 dB/cm attenuition of 900 MHz, so interference power in this room is one hundred times weaker than in the street. Their wireless networks don't work well because of the brick. The ION building is made of cinderblocks and steel girders. There might be as little as five centimeters of light-weight concrete between the outside and the inside. At ION, we set up an Octal Data Receiver and plug in four antennas. We arrange them as if they were on the shelves of an IVC rack, with no enclosure or absorbers around about. We measure reception as if in a cage between them by holding the entire transmitter in our fist and rotating at random for ten seconds, while watching reception in the Recorder Instrument. With one antenna we get 30±10% reception, two give us 60±10%, three gives us 90±5%, and four gives is 97±3%. 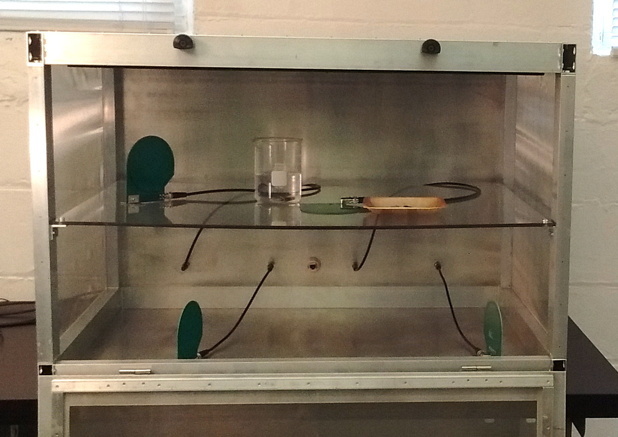 [31-DEC-13] We set up a small isolation chamber, as shown below. It consists of six AN-77 absorbers, gray sides inwards, standing on the concrete floor of our office at 5 Pratt Ave. We wrap an outer layer of resistive sheet around the absorbers. We put a cover of the same resistive sheet on top. We assume the concrete floor is a perfect absorber, because we are in a basement. Figure: Small Isolation Chamber on Concrete Floor. The 900-930 MHz interference in our 5 Pratt Ave location varies from one second to the next. It peaks at around −45 dBm, but can drop as low as −84 dBm. Almost all the power is concentrated in the 925-928 MHz band. Reception on an open work bench is reliable only if we set our transmitter right next to the antenna. We set up our A3008C spectrometer and measured the 925-928 MHz power for one minute with the pick-up antenna on the corner of our work bench, one the floor out in the open, in the center of our small isolation chamber, and in the corner of our isolation chamber. Figure: Interference Power in Separate Minutes and in Various Locations. The highest interference power we observe outside the enclosure is −45 dBm, but inside the enclosure the power never rises above −68 dBm. It appears that this enclosure is providing 23 dB of isolation. We place a Subcutaneous Transmitter (A3019D) inside the enclosure 50 cm from each of two antennas connected to an Octal Data Receiver (A3027C). Over the course of one minute we obtain 100.0% reception. We remove the enclosure lid and reception drops to 29%. [28-FEB-14] We make a curtain 2.0 m wide and 2.2 m high with curtain rings for the chamber test at ION. We hang the curtain in our office. We lay down a mat of copper teffeta fabric. We make a 1.2 m × 1.2 m absorber back wall and two 1.2 m × 0.6 m side walls. 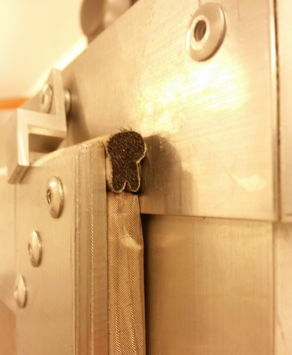 We suspend a piece of resistive sheet above the isolation chamber thus created. The result is shown below. Figure: Isolation Chamber with Front Curtain. We place three antennas on a table inside the chamber and three transmitters, which we move around to different places on the table. Reception without the chamber is 0-100% because of intermittent −58 dB ambient interference at 926 MHz. With the chamber as shown, we get reception 95-100%. When we move aside the curtain, reception drops to 70-100%. Peak interference power in the closed chamber is around −64 dB. [07-MAR-14] In the new animal room on the tenth floor at ION in London, we test reception in an IVC rack with and without the radio-frequency isolation chamber shown below. 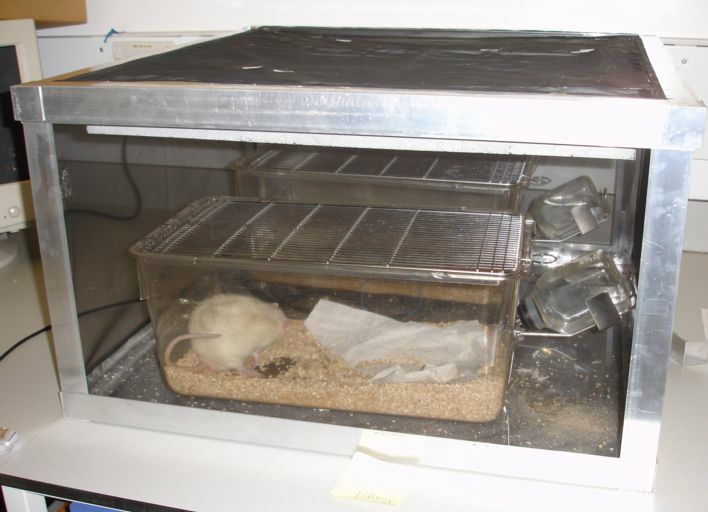 Each cage is for one or more mice, and has a metal grating to hold food pellets under the lid. We place the eight antennas of an Octal Data Receiver (A3027B) between the floors of cages B7-F7 and B6-F6. We measure reception in the rack by removing one cage and rotating and translating an subcutaneous transmitter (A3019D) on the end of a stick for one minute within the volume the cage would have occupied. We record the fraction of messages received. When the curtain is in place, we cut a hole in the curtain and pass the stick through the hole. Before we install the isolation chamber, we measure the reception in cage spaces as follows: E7 = 92.5%, E6 = 99.2%, E5 = 96.7%, G7 = 85.1%, B7 = 91.6%, E7 = 91.8%, D5 = 99.6%. After we install the isolation chamber we get: E7 = 100.00%, F7 = 100.00%, H10 = 100.00%. [08-OCT-14] We have a self-propelled ball to which we can attach a transmitter and have it wander around on the floor of an isolation chamber. We set up a chamber in our office and measure reception with varying numbers of antennas, as we report here. With four antennas and the roof on, reception is 99.9%. With the roof off, it's only 86.8%. [05-FEB-15] At ION, we try three types of transmitter in their IVC rack isolation chamber. There is a large gap in the wall at the rear left, where the lower pipe exits, there being no hole in the wall for the pipe. With the front curtain sealed, we measure reception with thre types of transmitter. With a single-channel, rat-sized A3028R (number R69.2) in various loctaions, we obtain 100% reception. With two-channel mouse-sized A3028A (number A55.13) in various locations we obtain 100% reception also. With the single-channel mouse-sized A3028B (number 55.10) in various locations we obtain 75% reception. With two implanted A3028Bs we also obtain 75% reception. When we open a 30-cm long 3-cm wide gap at the end of the front curtain, reception deteriorates for all transmitters. [24-APR-15] We hear from ION that they have assembled a second IVC rack isolation chamber using our two-piece front curtain, mesh ceiling, copper taffeta floor mat, and fifteen absorbers on the aluminum back and side walls. With careful antenna arrangement, reception within the enclosure is excellent. They have to take care to clip the front curtains together to keep out interference. [24-JUN-15] ION measures reception in an IVC rack isolation chamber. They arrange four antennas around four mouse cages, each with a mouse and A3028B transmitter. Two other cages are on the far edges of the rack. They measure reception during four hours with an Antenna Combiner (A3021B) and Data Receiver (A3018D) and then for four hours with an Octal Data Receiver (A3027D). Table: Reception in New IVC Rack. Reception with the Octal Data Receiver is robust for all six transmitters. With eight antennas, reception should be robust from fourteen transmitters. [15-JAN-16] The two IVC Isolation Chambers are working well at ION, but only so long as the edges of the curtain are clamped on sides, top, and bottom to the absorber walls, ceiling mat, and floor mat respectively. The vets have trouble undoing all the clips and fastening them up again. We assemble the canopy shown below, which will replace the ceiling mat and curtains. Figure: Canopy with Door, Designed for IVC Rack. The sides of the door frame will clip to the absorber walls on the side of the IVC Rack. The ceiling will clip to the absorber walls on the sides and back of the IVC rack. The bottom of the door frame will be overlapped by the floor mat, which will extend farther out from the IVC rack than the door. The zippers are overlapped by a 50-mm flap of mesh fabric, to reflect interference away from the narrow strip of non-conducting fabric on either side of the zipper. The zippers unzip from bottom to top. Once one zipper is open, we can step inside the door and remove cages from the rack. If one zipper jams, we have a spare. If we want to open the rack up completely, we undo both zippers and throw the door over the top of the rack so it is out of the way. [05-JAN-19] We have twenty-five days of recordings from seven A3028P2 transmitters with 13-mm helical spring antennas implanted in mice, operating within an IVC rack with isolation chamber. We obtain hourly average reception for all seven devices and plot. Figure: Reception from Seven A3028P2 Implanted in Mice in IVC Rack versus Time. For detail of eight days see here. Average reception is 97%. Short drops to 80% or below are shared by all seven devices, suggesting that the curtains of the chamber were open for cage cleaning and animal feeding. The final drops at day 19, 22, 23, and 24 are exhaustion of the transmitter batteries. The final three devices are still running. These devices are equipped with a 13-mm long antenna made out of a 500-μm helical steel wire, which emits less power than our usual loop antennas. [04-SEP-18] Our 915-MHz radio signals are attenuated by roughly 1 dB (10%) for each centimeter they travel through water or body tissue (see here). The dielectric constant of water at 915 MHz is roughly 90, which means the wave velocity is ten times slower than in air. When 915 MHz tries to move from air to water, this mis-match in propagation velocity results in 60% of the incident power being reflected. After that, the incoming power spreads out by diffraction and attenuates at 1 dB/cm. If we want to record from aquatic animals, we can use a sufficiently large body of water as a means of isolating our recording system from ambient interference. Figure: Water Tank Chamber. 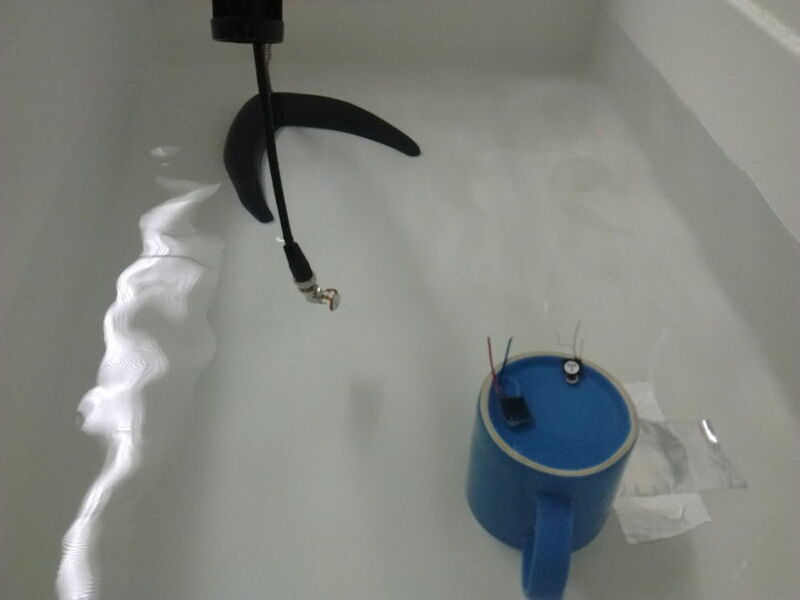 Here we have a 33-nH inductor used as a receiving antenna, suspended in a 30-cm deep reservoir of water. Two transmitters, one with a 13-mm helical antenna and another with a 30-mm loop antenna are 20 cm away. All antennas are at depth 15 cm. We fill our sink with water and set up the reception test shown above. A 33-nH pick-up coil receives −68 dBm of ambient interference when pressed against the wall of the sink or in the center of the reservoir. An 80-mm loop antenna picks up −61 dBm. When we move the 30-mm transmit antenna at randome within 30 cm or the pick-up coil, we get roughly 80% reception. The 13-mm helical antenna gives us roughly 70%. When we add a 3-dB damping antenna to the base of the antenna cable, we get roughly the same performance. A 20-mm quarter wave wire in place of the coil gives approximately the same performance. [23-SEP-13] Since the successful implementation of the FE2B box-style faraday cage, faraday enclosure have become an integral component of our SCT system. Our FE2B top-loading box enclosure and FE2C front-loading box enclosure have an aluminum frame and steel mesh walls. An antenna cable passes through the frame with a BNC feedthrough. The enclosure measures 70 cm × 70 cm × 40 cm. It is large enough to fit two plastic animal cages, with room to spare for the water bottles. On the underside of its lid is a 6-cm thick 61-cm wide square of microwave-absorbant foam. The microwave absorbant foam dampens internal reflections of transmitter signals and also absorbs interference power that manages to penetrate the enclosure walls. Without the foam, the enclosure acts as a resonant cavity in the 902−928 MHz band. When the enclosure resonates with a transmitter signal, the signal interferes with itself, causing large reception dead spots. When the enclosure resonates with external interference, the interference lingers and builds up in the enclosure, compromising its powers of isolation. With its absorband foam and conducting walls, the FE2B gives us a minimum of 30 dB isolation at 900 MHz, meaning that the interference power within the enclosure is a thousand times less powerful than outside. 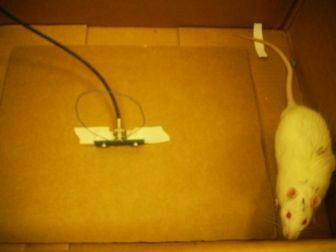 Using a single FE2B enclosure connected directly to a Data Receiver (A3018C), ION obtained an average of 99% receptioni from a transmitter implanted in an active rat. Without the enclosure, reception drops as low as 25%. With four FE2B enclosures connected to an Active Antenna Combiner (A3021B) and Data Receiver (A3018C), ION obtains average reception rates that are consistent with those we expect from collisions between transmitters. 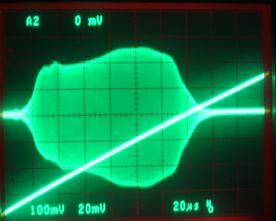 Thus we see that the FE2B's 30-dB isolation is sufficient to render insignificant the interference in central London. With eight FE2B enclosures, ION uses two separate Active Antenna Combiners (A3021B) with Data Receivers (A3018C) to create two independent subcutenaous transmitter systems that record from up to twenty-four animals at the same time. We see no compromise in the reception of one system due to the presence of the other. When it comes to operating the SCT system inside an IVC (Individually Ventilated Cage) rack, our first thought was to use a canopy of conducting fabric large enough to enclosure the rack. But we were unable to obtain adequate radio-frequency isolation with such a canopy, even when we filled the entire back wall with microwave absorbers. We turned to isolation chambers that rely less upon reflection and more upon absorption. Our IVC Rack isolation chambers, when populated by the eight independent antennas of our Octal Data Receiver (A3027) provide robust reception throughout the rack.